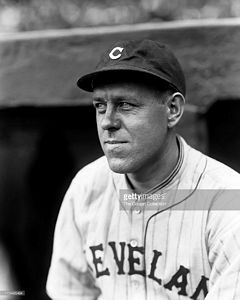 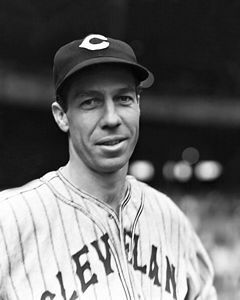 Cleveland's nickname was Blues in 1901, Broncos in 1902, and Naps 1903-14 before settling on Indians in 1915 in tribute to Louis Sockalexis, a popular player in the 1890's who was the first Native American to play Major League baseball. 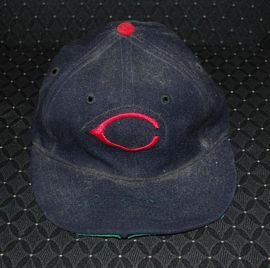 Solid navy worn home and road. 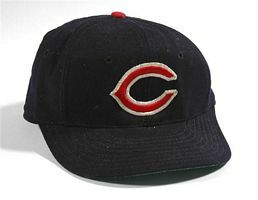 Style of the "c" changes slightly, the middle of the letter is slimmed down. 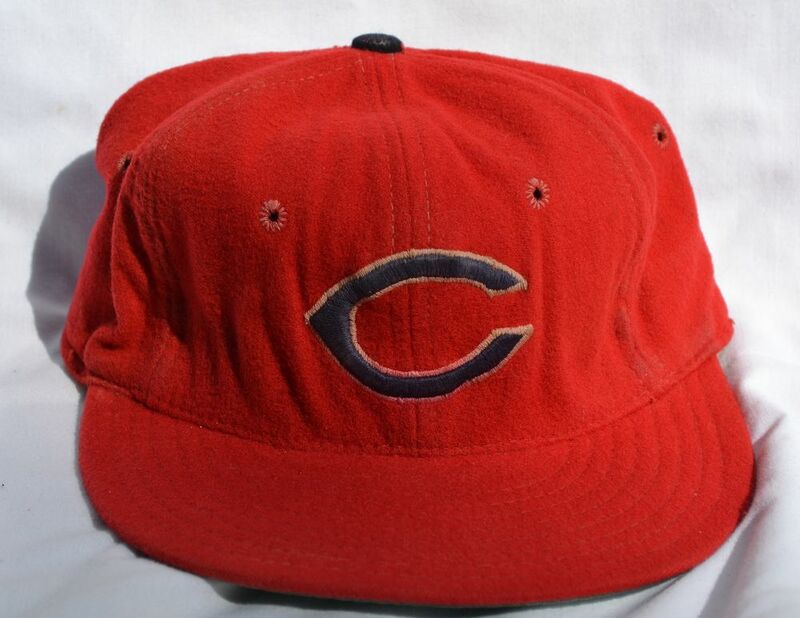 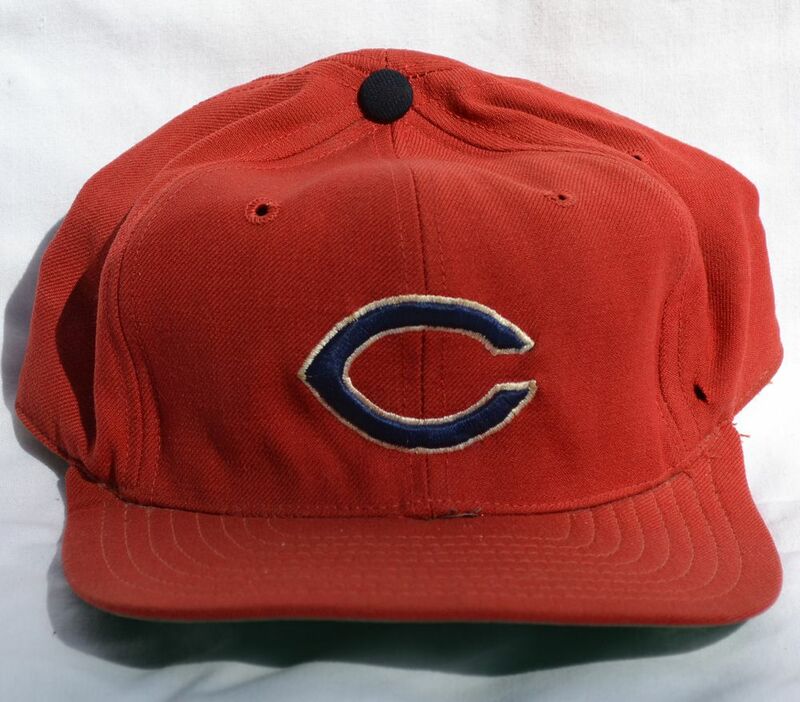 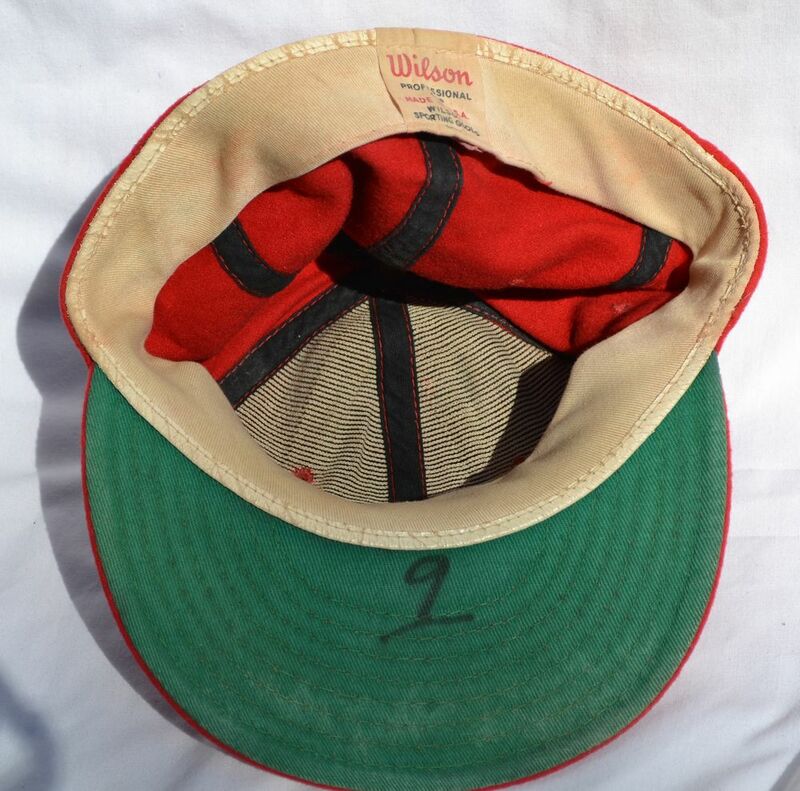 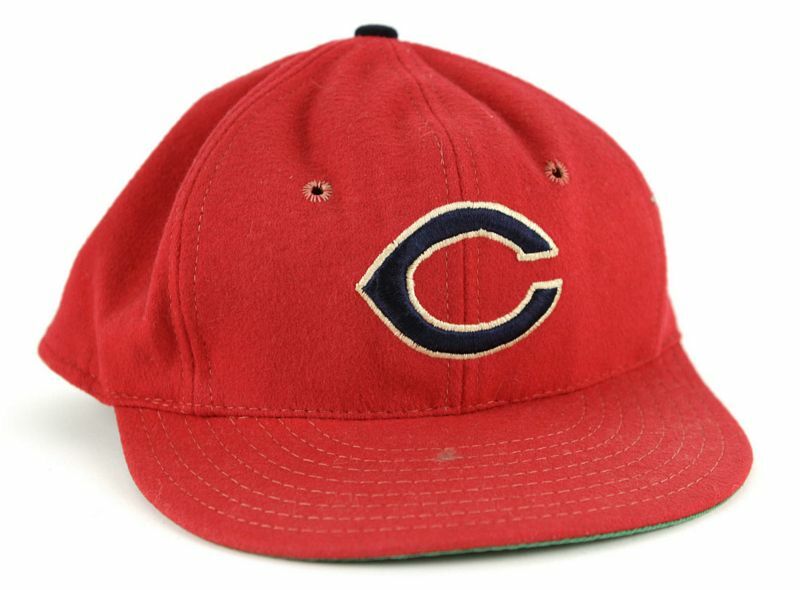 The home cap gets a red wishbone "C". 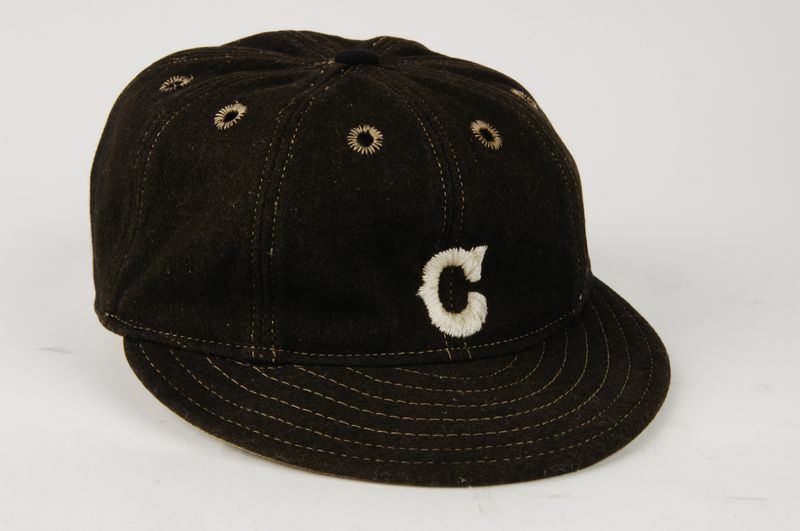 The small white rounded "c" stays on road caps and is modified a bit - note the upper serifs on the "c". 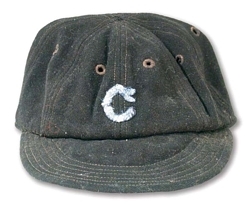 Road cap "C" changes to wishbone white. 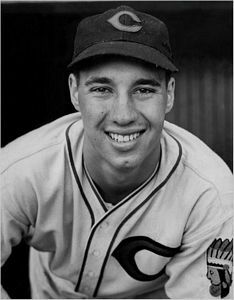 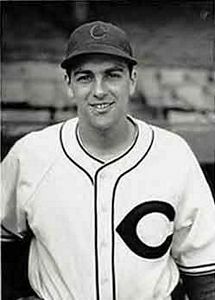 During 1941, a new logo appears, red on home caps, white on road caps. 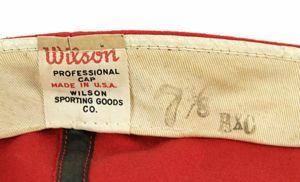 Red wishbone "C" on both home and road caps. 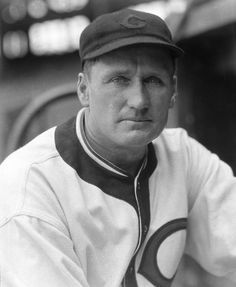 Red visors are added to caps in 1945. 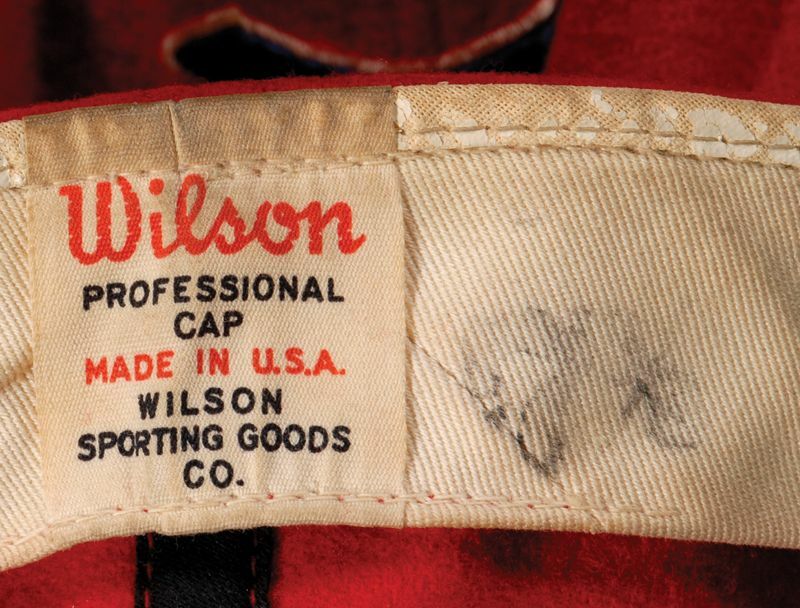 The logo gets thicker on Wilson caps. 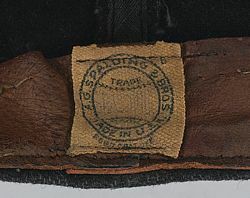 Some are sewn on a patch. 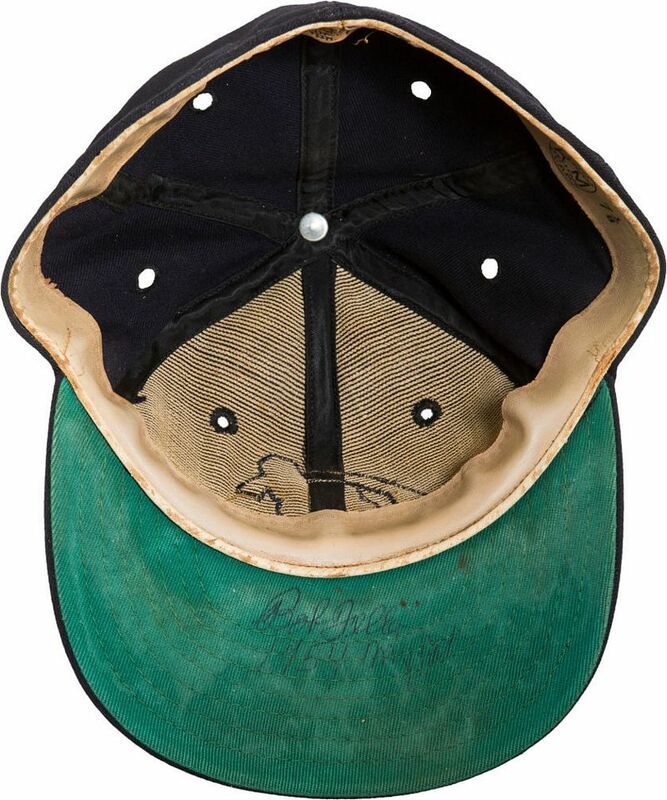 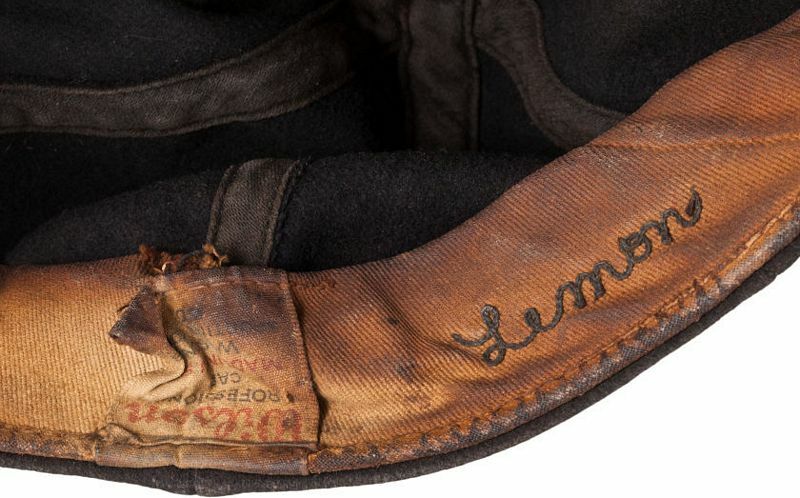 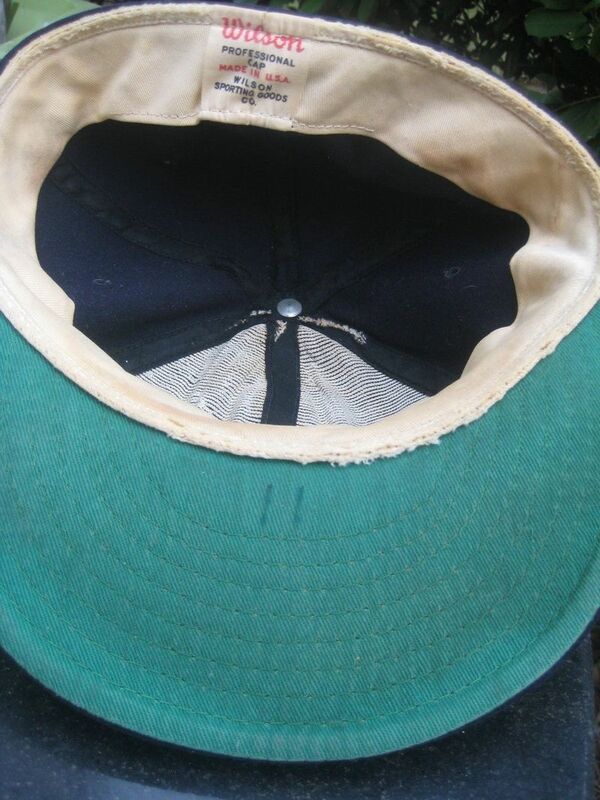 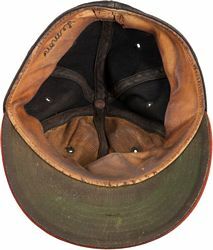 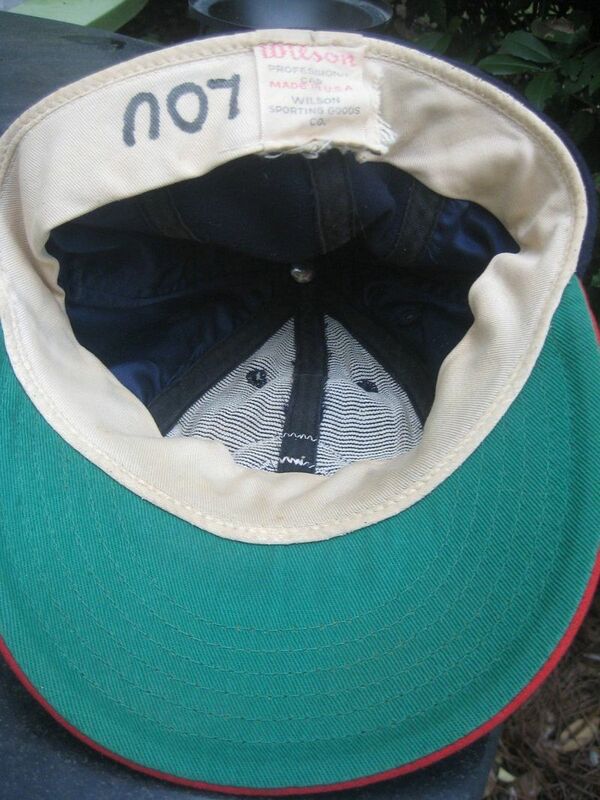 McAuliffe caps are also used starting in 1948 (anyone have one?). The logo is thinner. 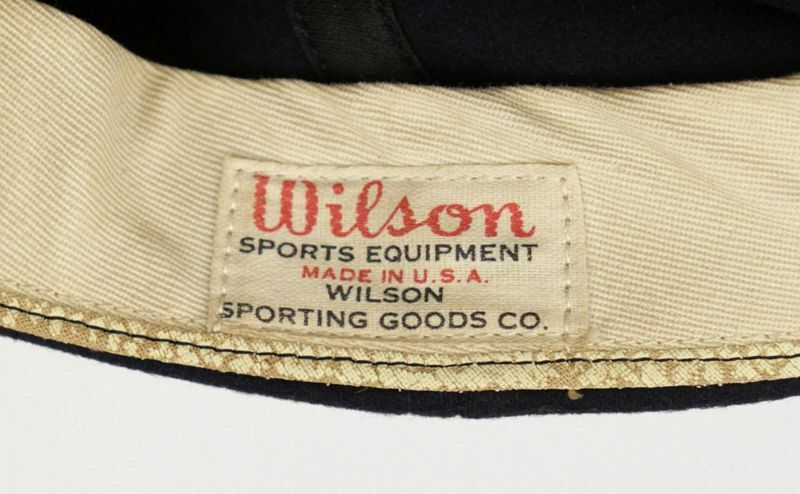 McAuliffe logos are much thinner than Wilson and a sewn on a patch. 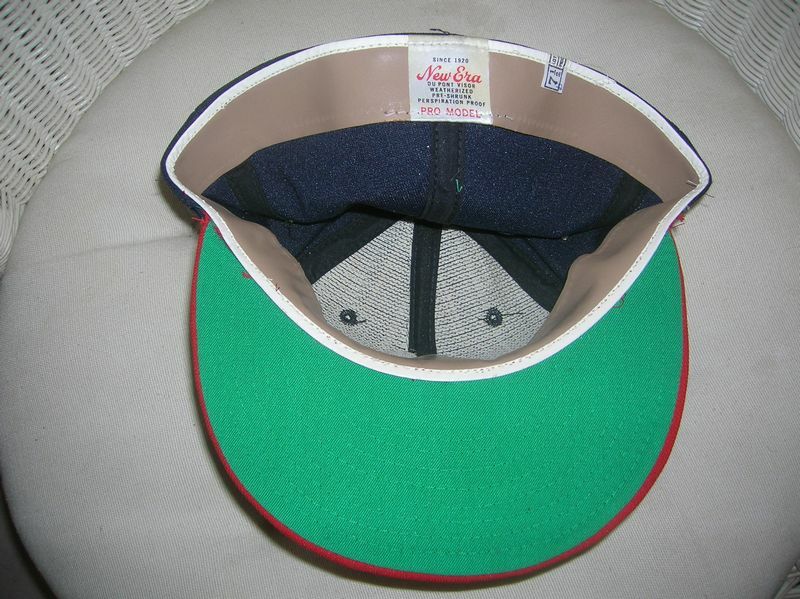 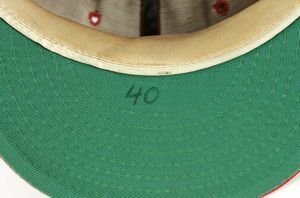 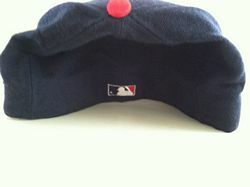 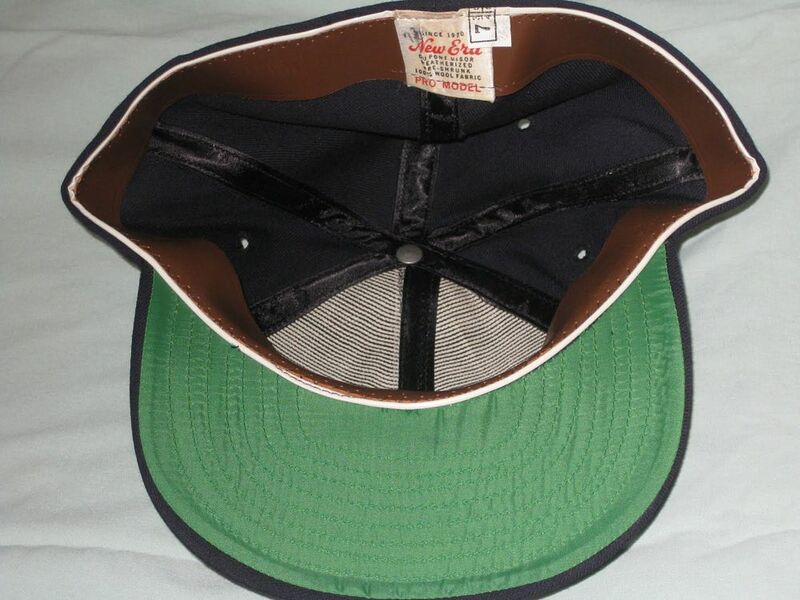 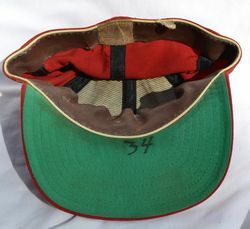 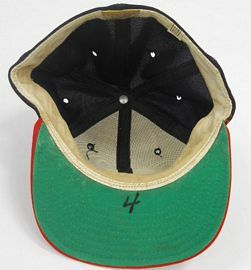 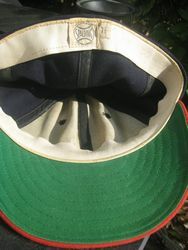 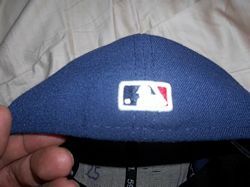 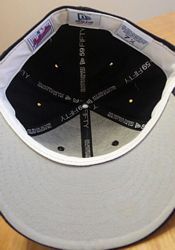 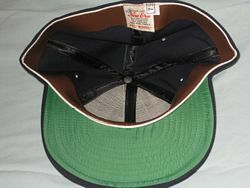 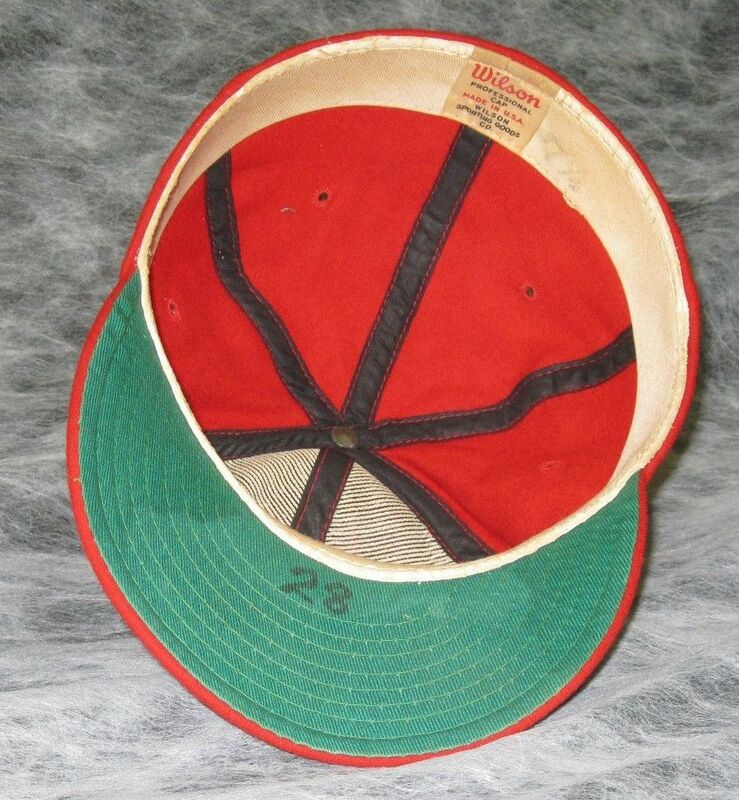 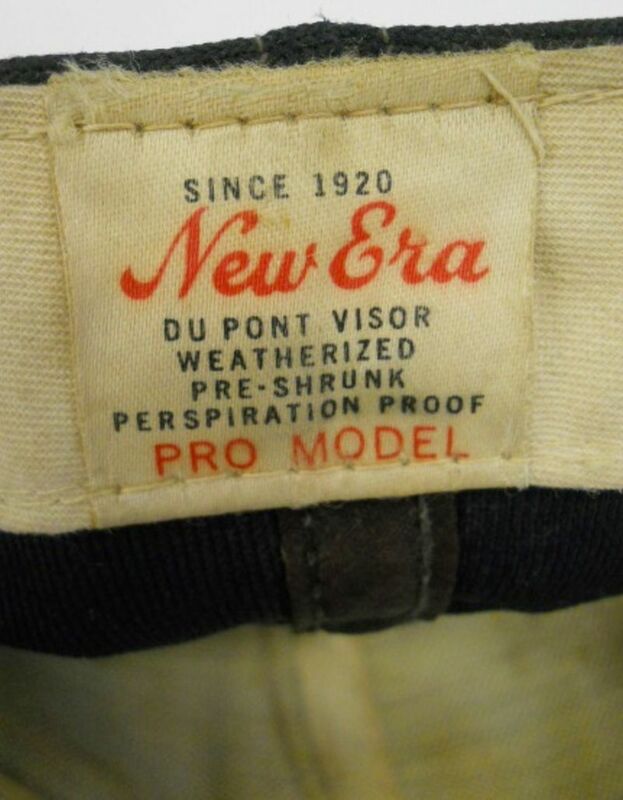 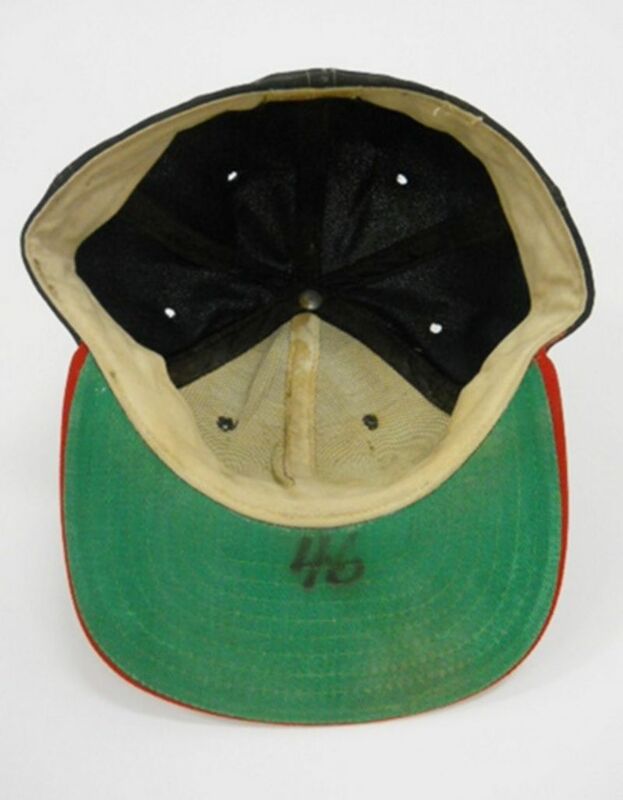 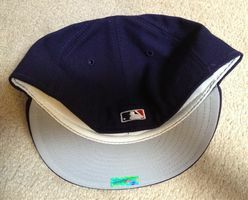 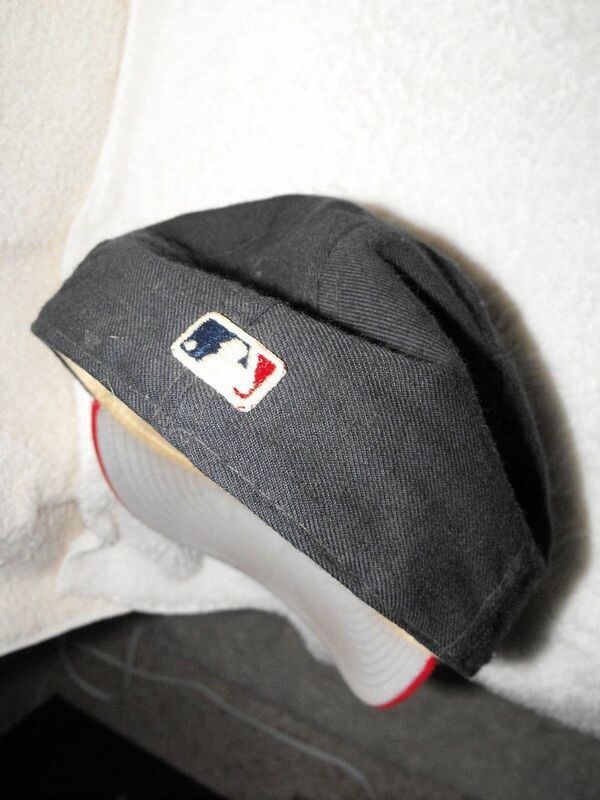 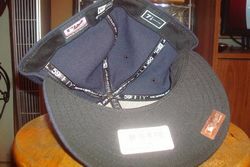 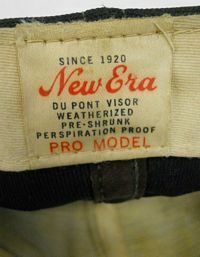 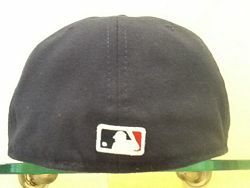 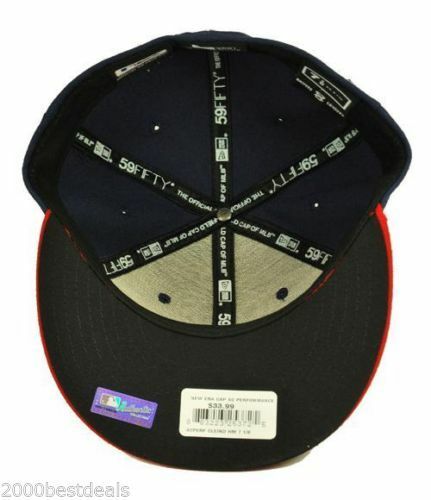 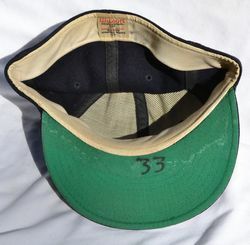 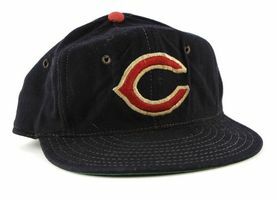 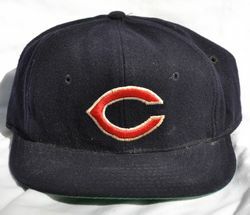 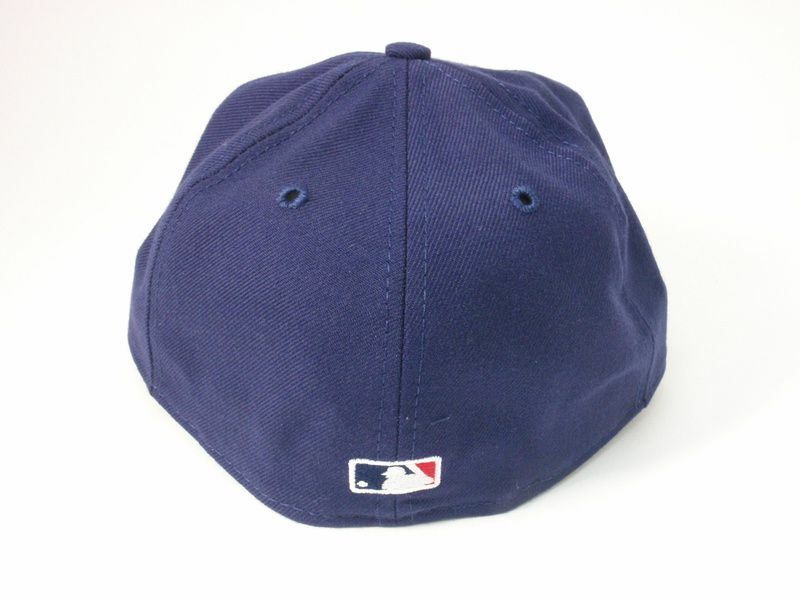 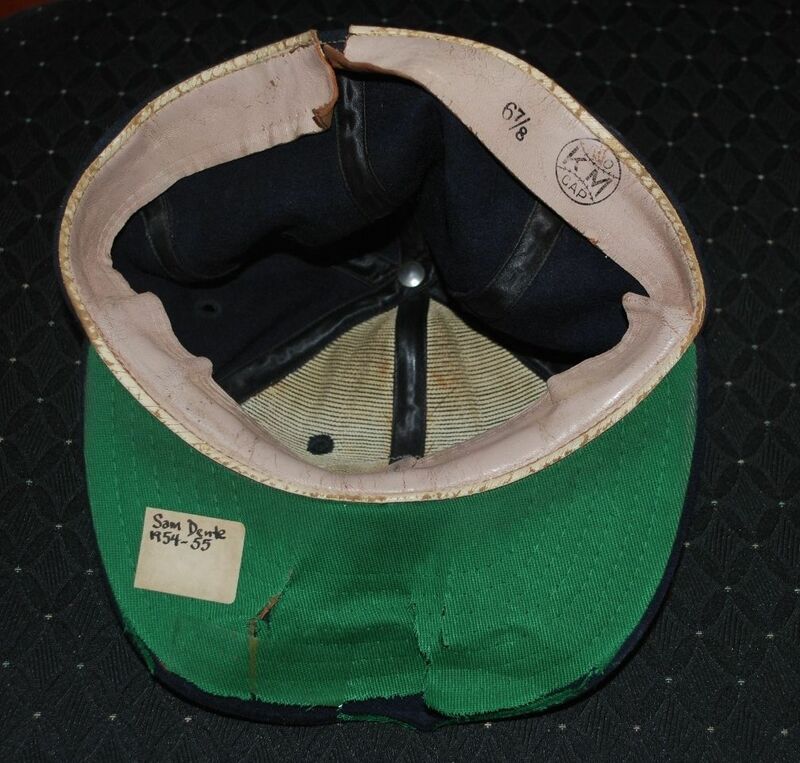 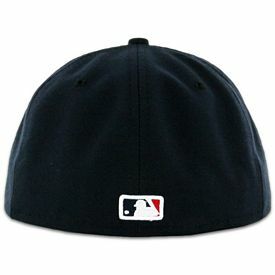 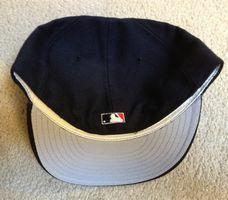 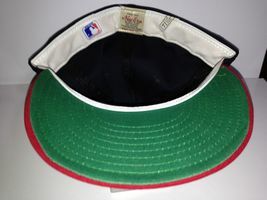 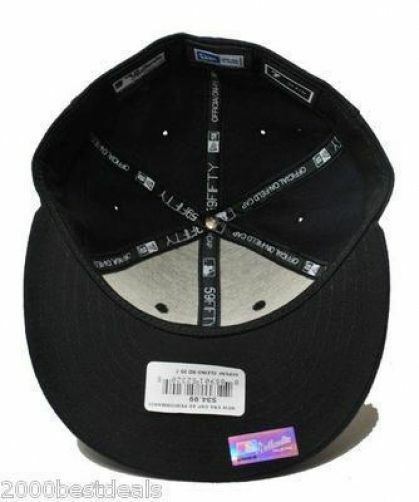 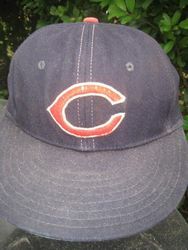 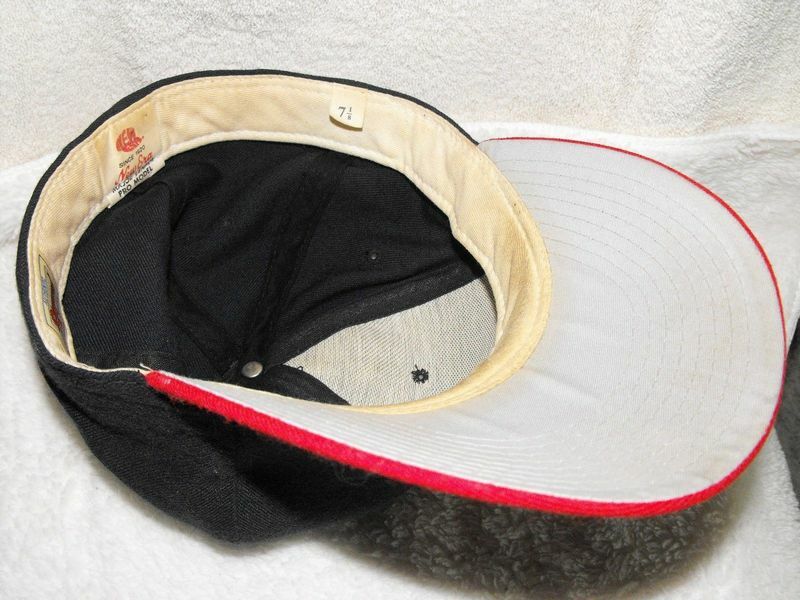 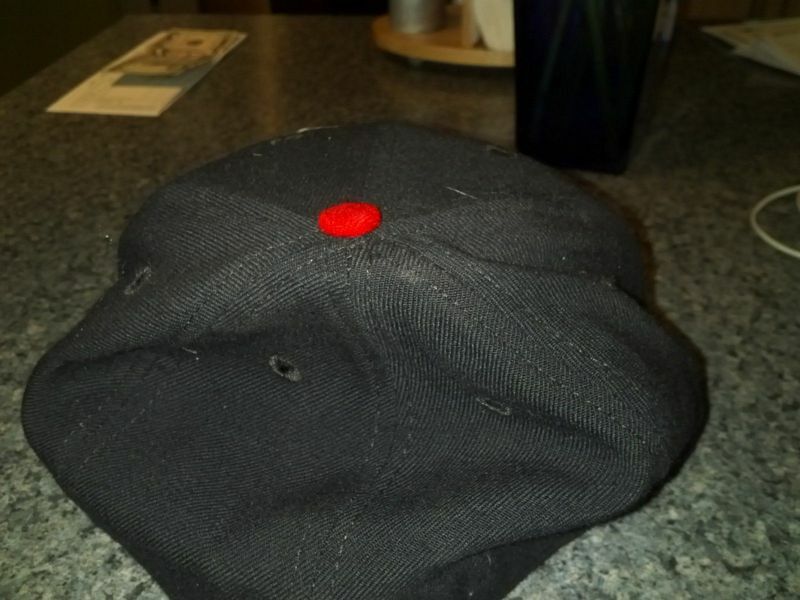 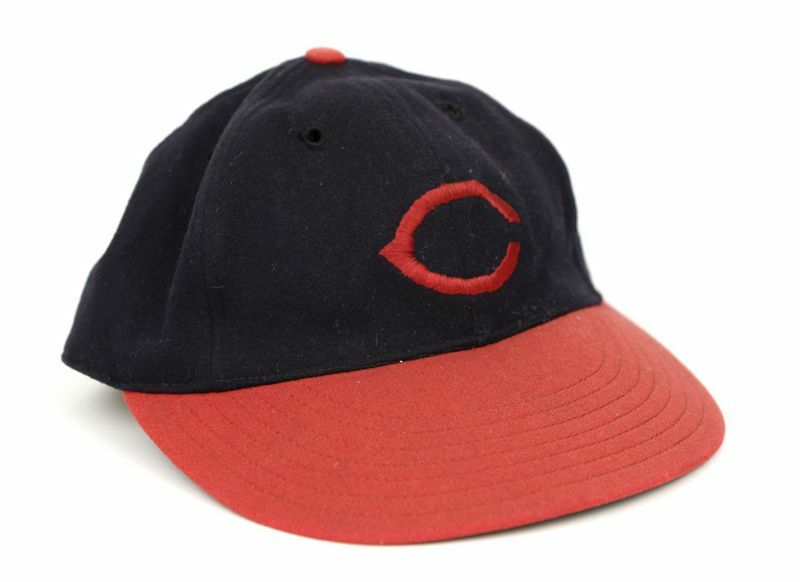 The 1953 cap here was also used in spring 1954. Chief Wahoo is added to the logo. 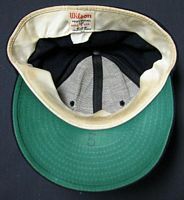 McAuliffe caps are used in 1954. 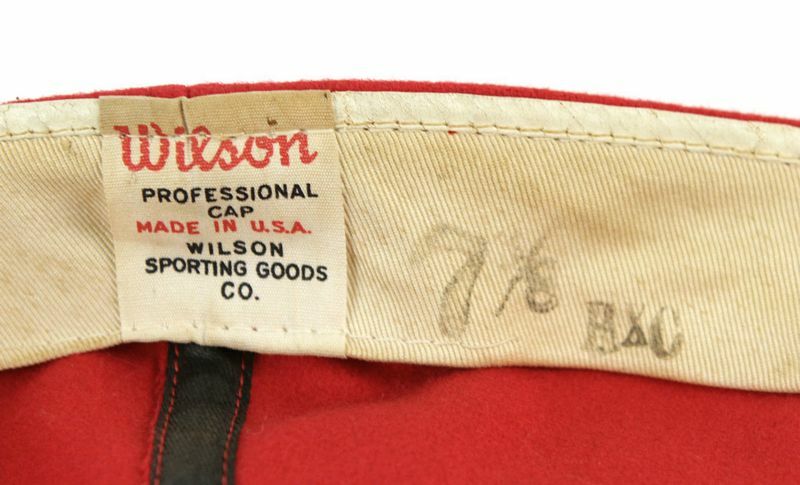 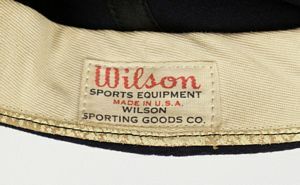 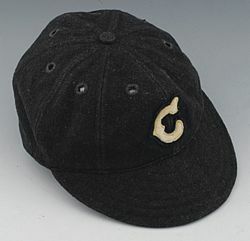 Wilson caps wore 1955-57 have the logo on a patch, and a thicker "C". 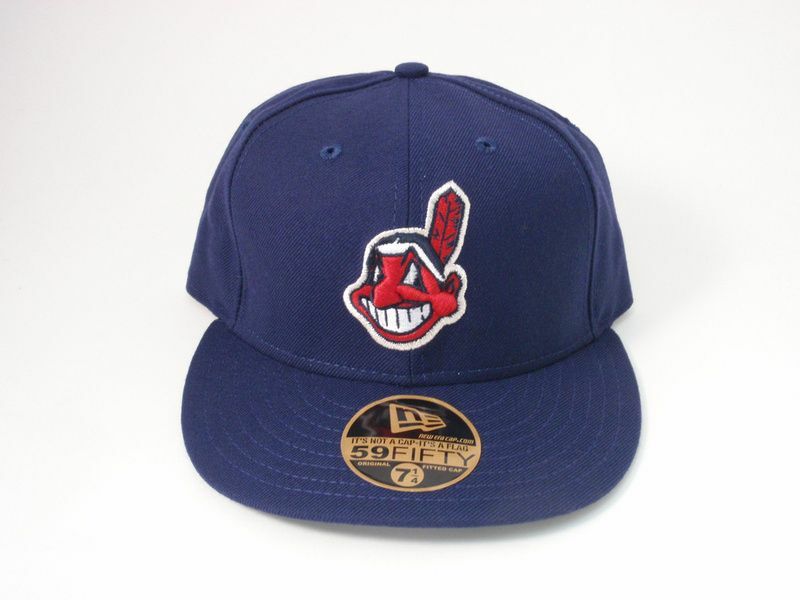 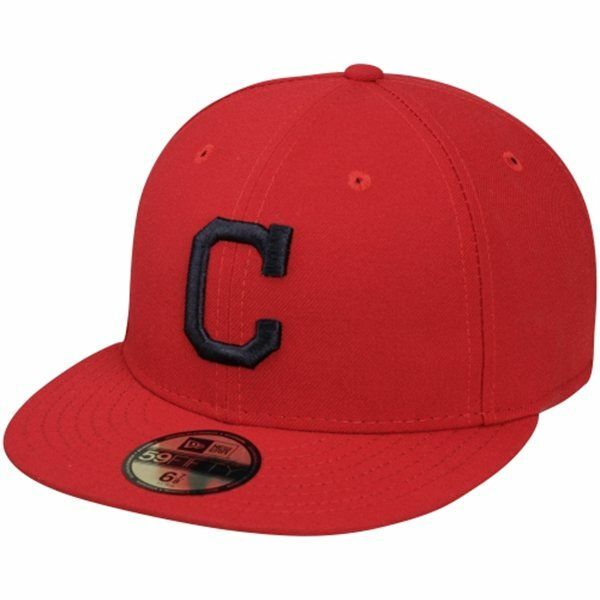 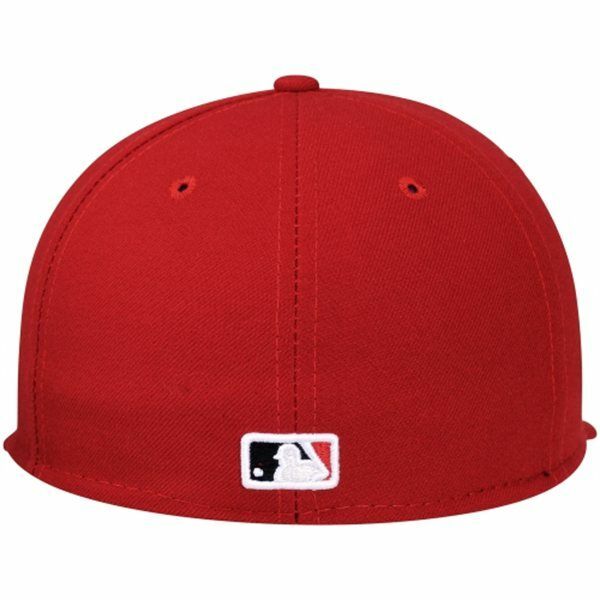 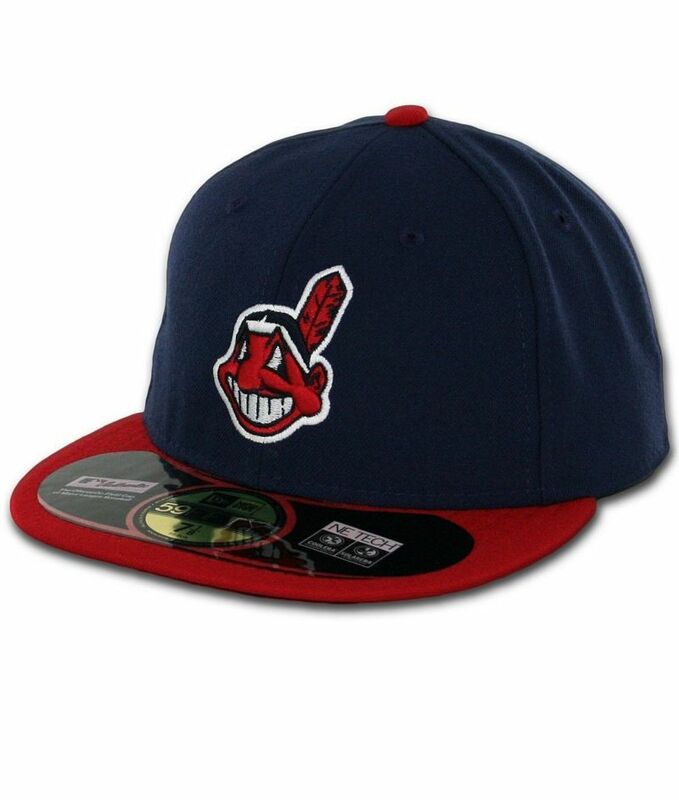 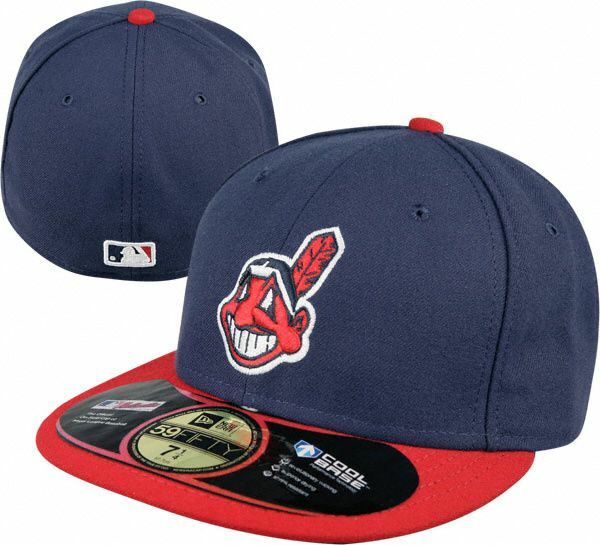 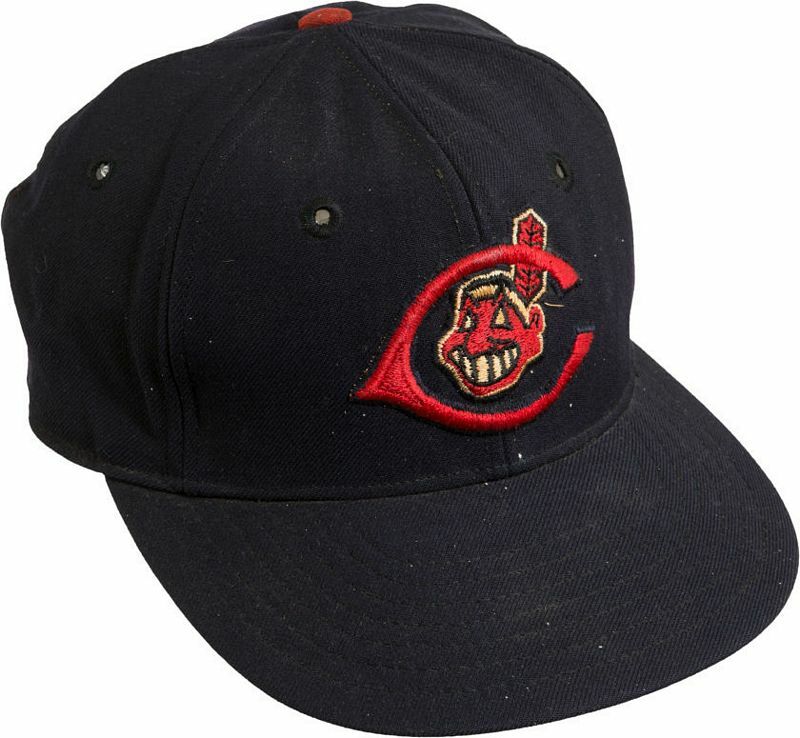 Chief Wahoo is dropped from the cap logo which gets white trim around the C.
Chief Wahoo pops back in for one season on Wilson caps. 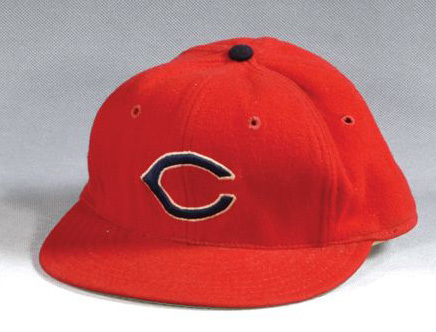 Now, the Chief's feather overlies the "C", the opposite of the 1954-57 version. Chief Wahoo is gone again as caps return to the 1961 style. 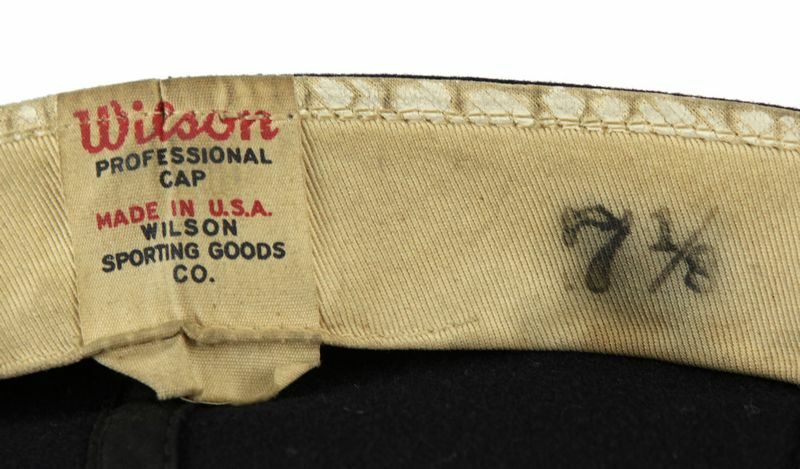 Wilson date code here is actually HXC, 1965. 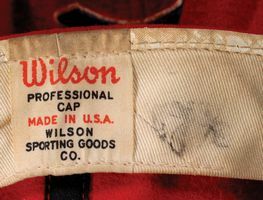 Wilson caps have very thick wool. 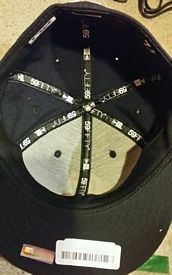 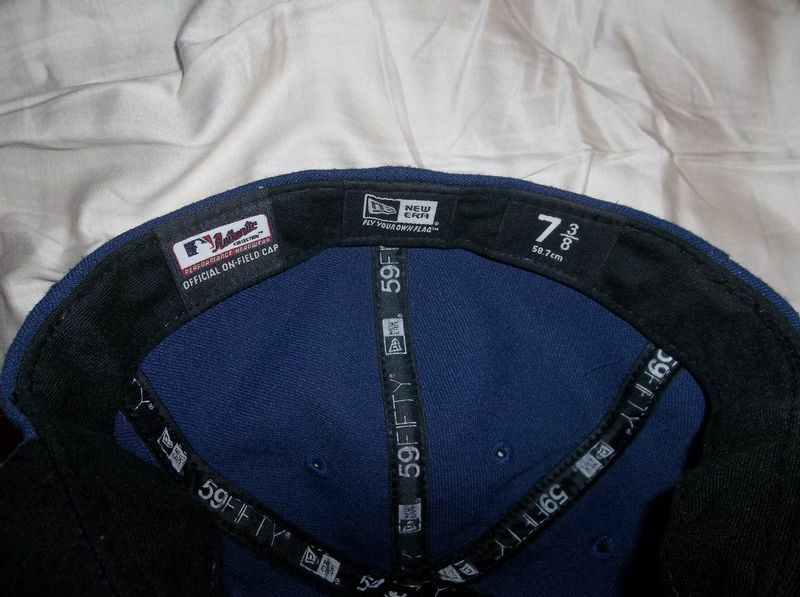 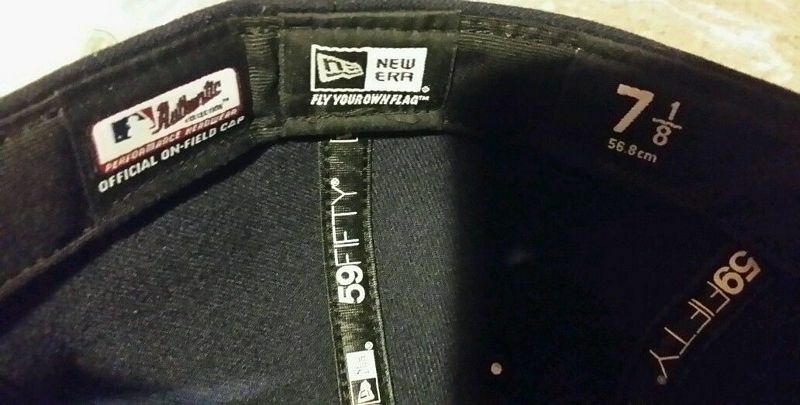 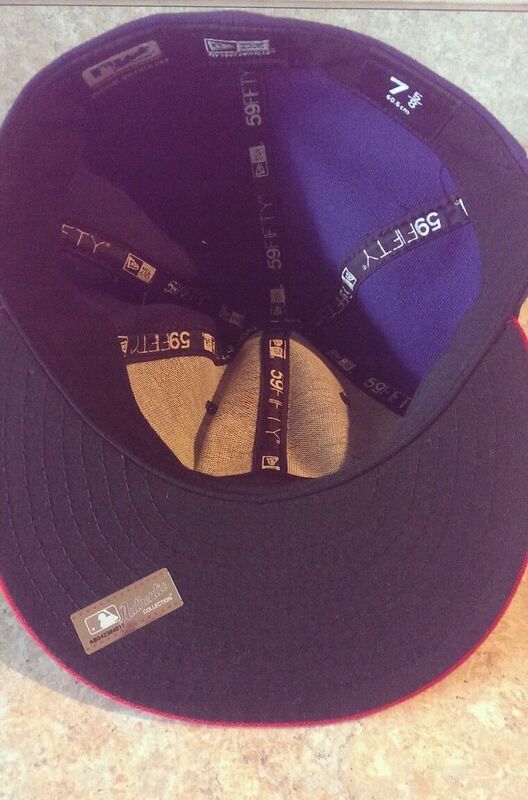 New Era caps start to appear. 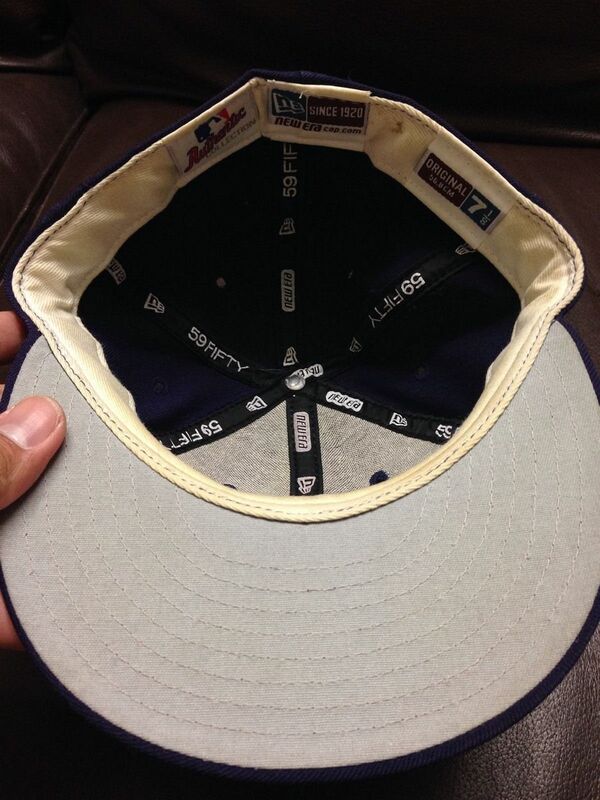 The navy cap returns, this time with a navy button instead of red. 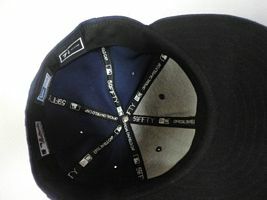 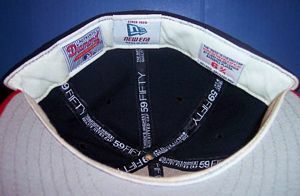 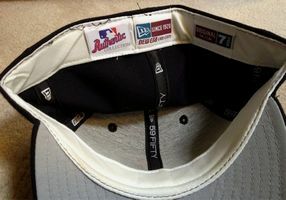 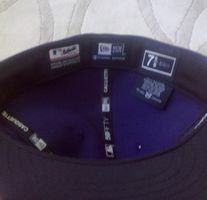 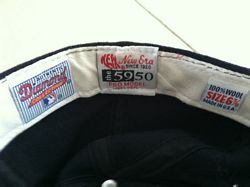 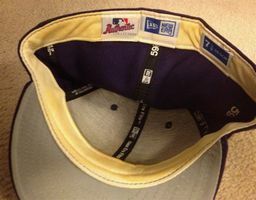 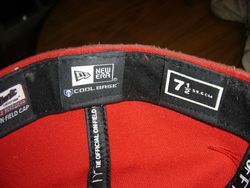 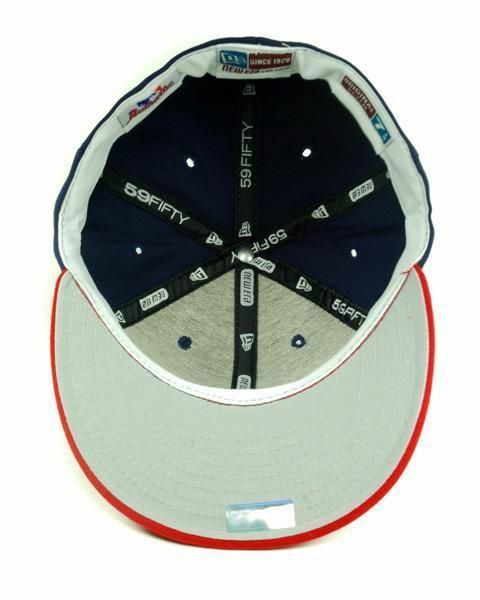 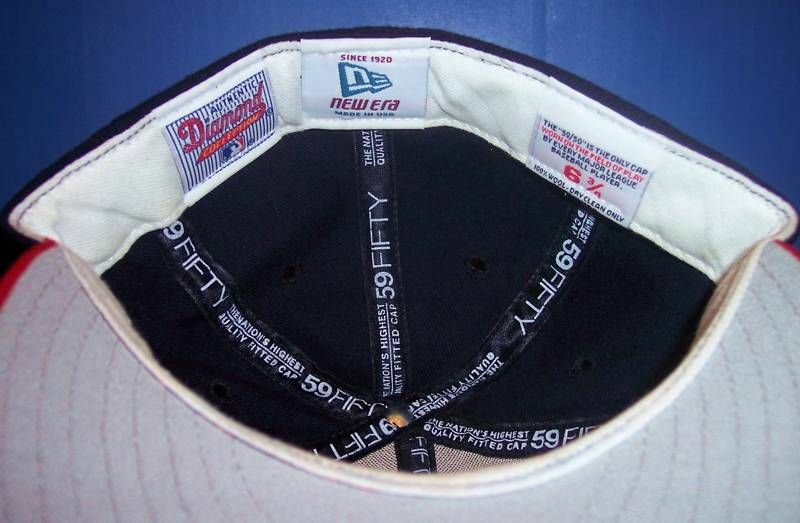 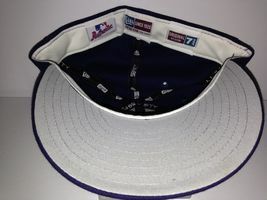 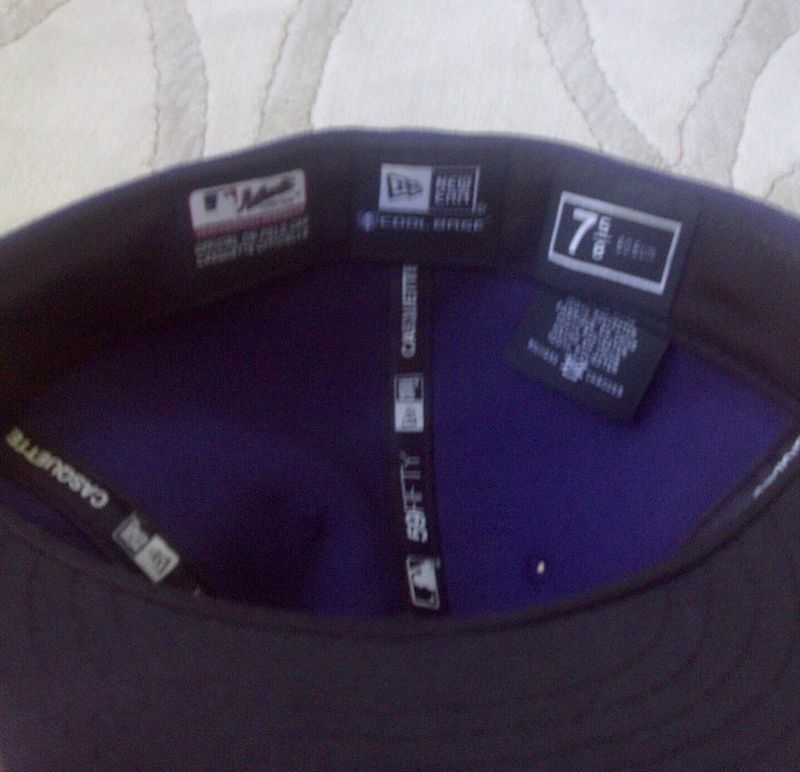 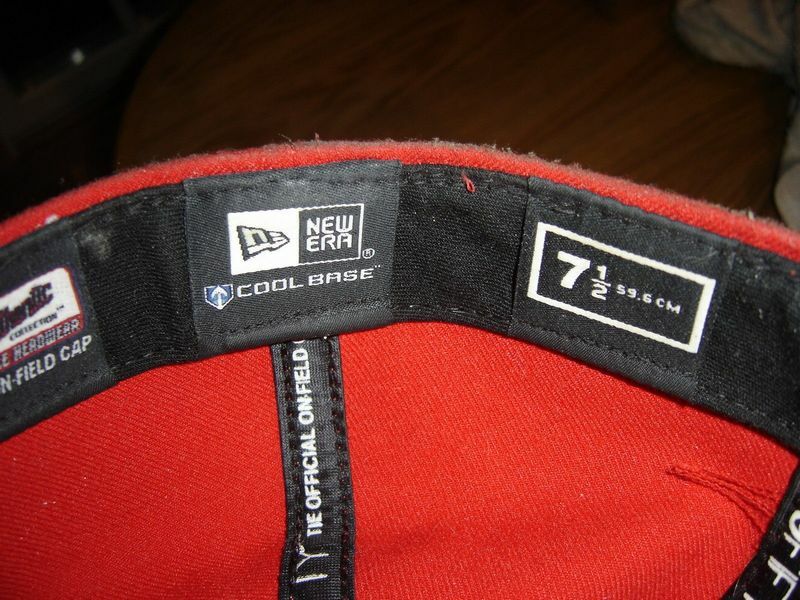 Note New Era's satin undervisor. The cap goes back to red. 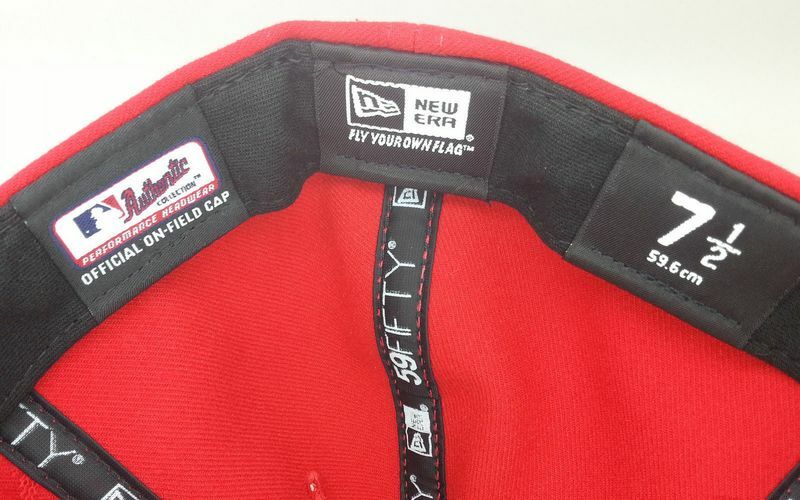 Caps change to nylon and a red visor cap debuts for use with a new red alternate jersey. 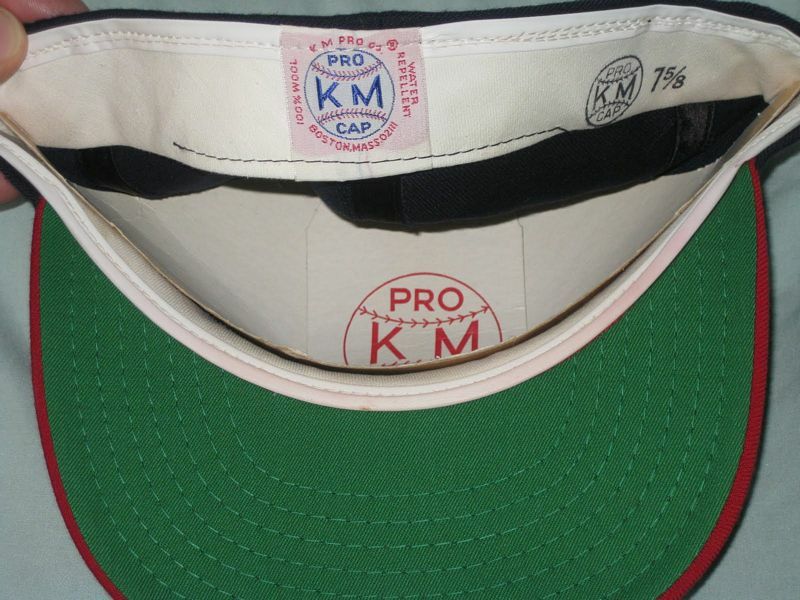 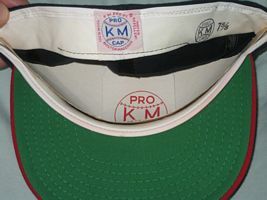 I doubt this KM Pro wool cap was worn on-field. The logo is too small compared to photos I've seen. Anyone know for sure??? 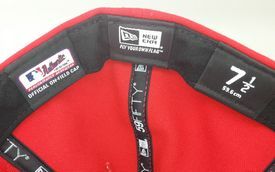 Navy cap is retired, the red visor cap is worn with all jersey sets. 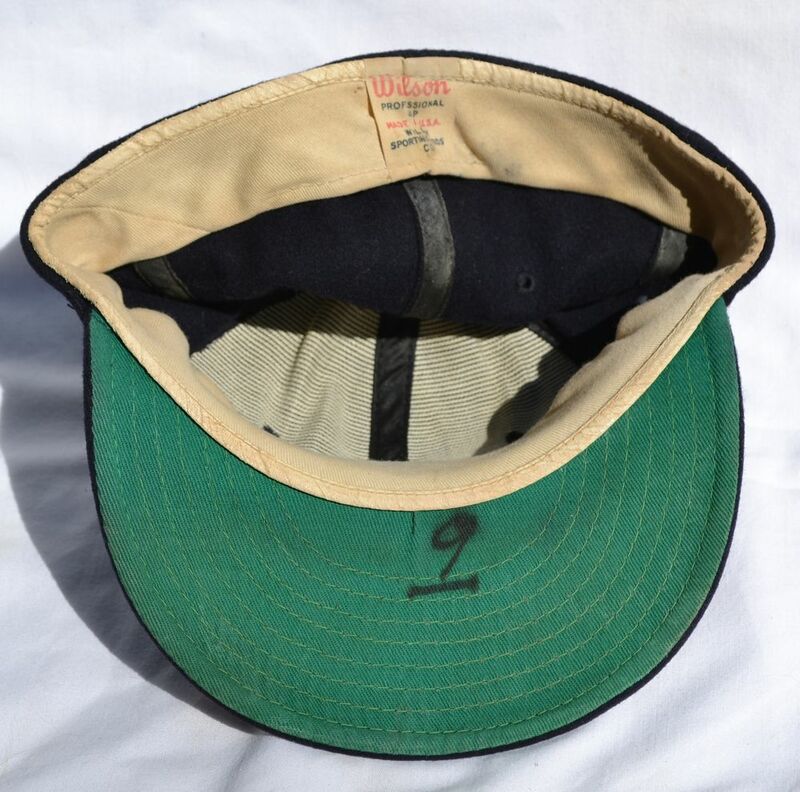 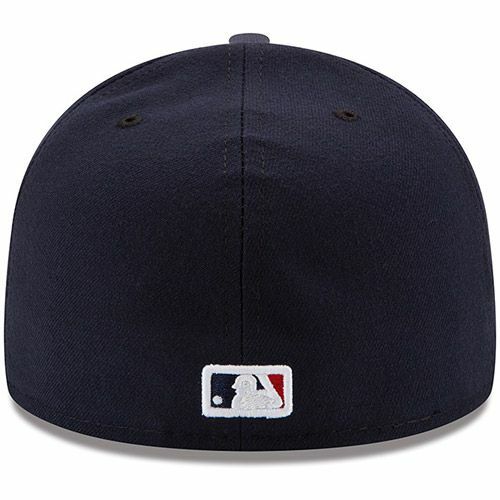 Logo returns to a traditional C. On some caps it's thick, others thin, even from the same year. 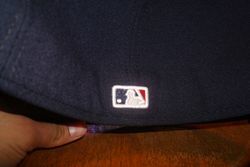 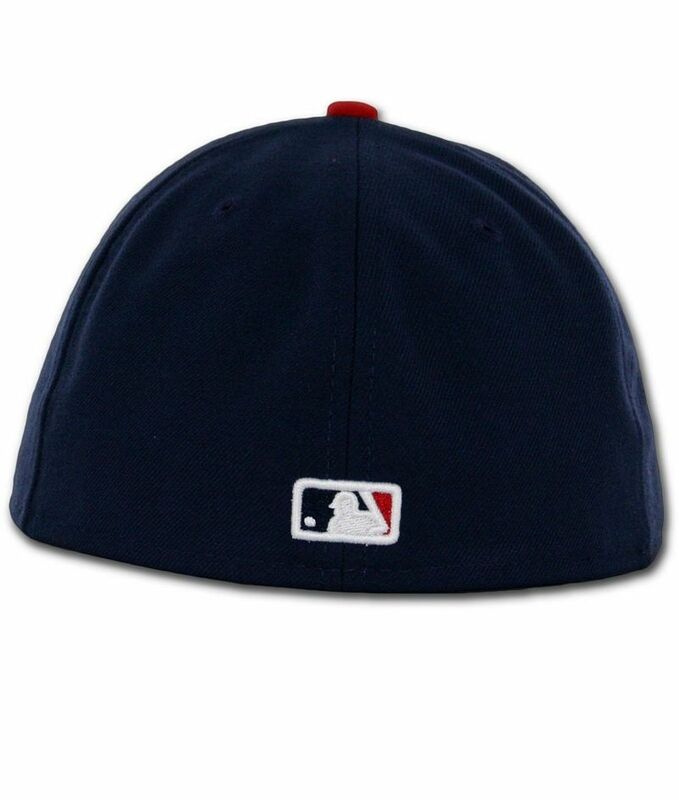 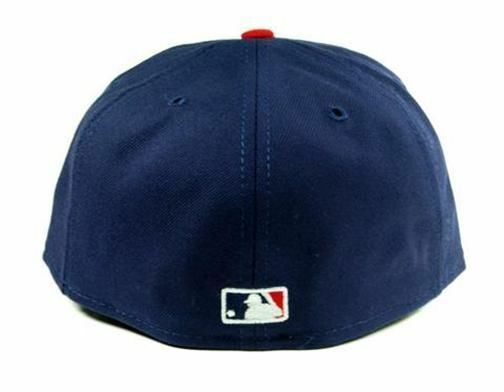 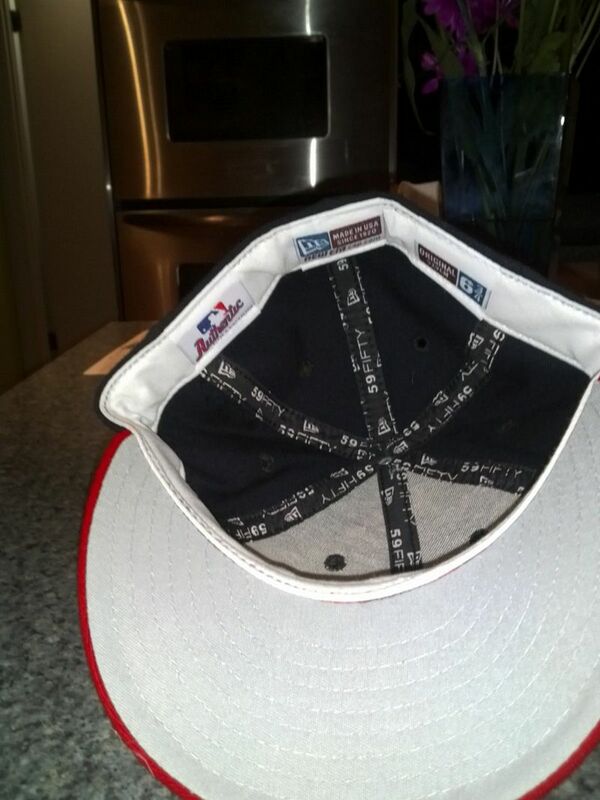 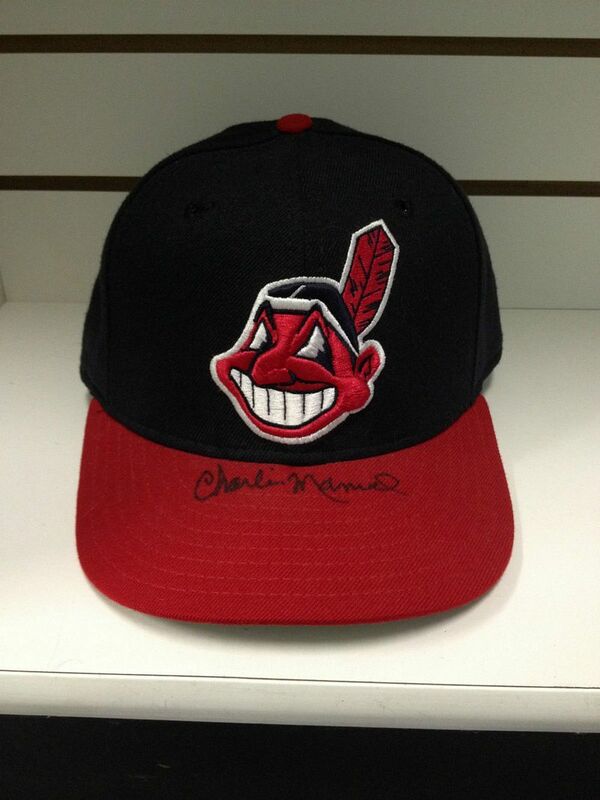 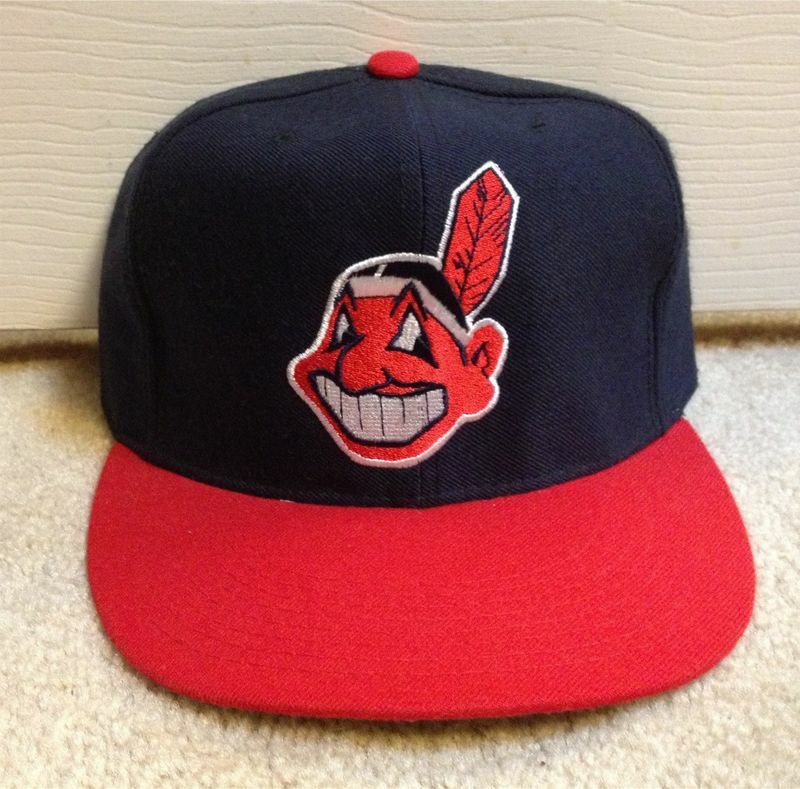 Chief Wahoo becomes the cap logo. 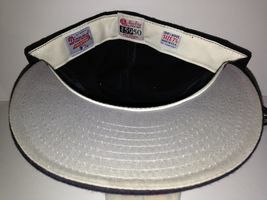 Undervisors turn to grey. Caps return to wool from nylon. 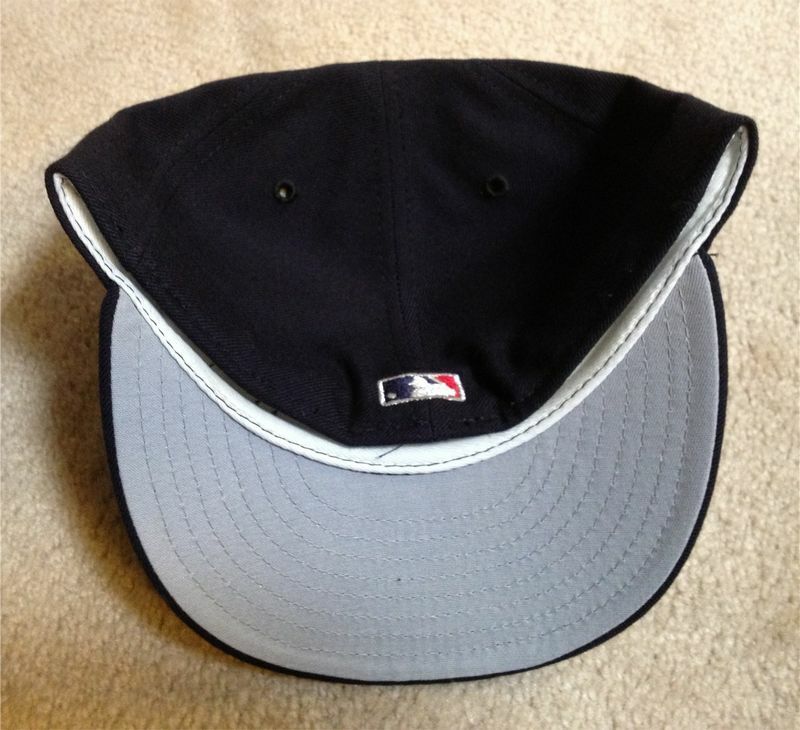 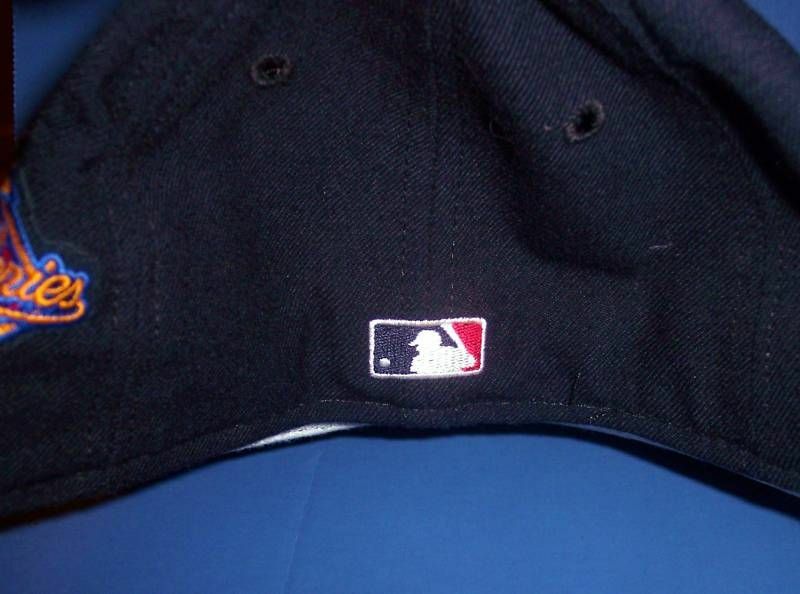 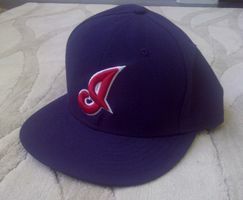 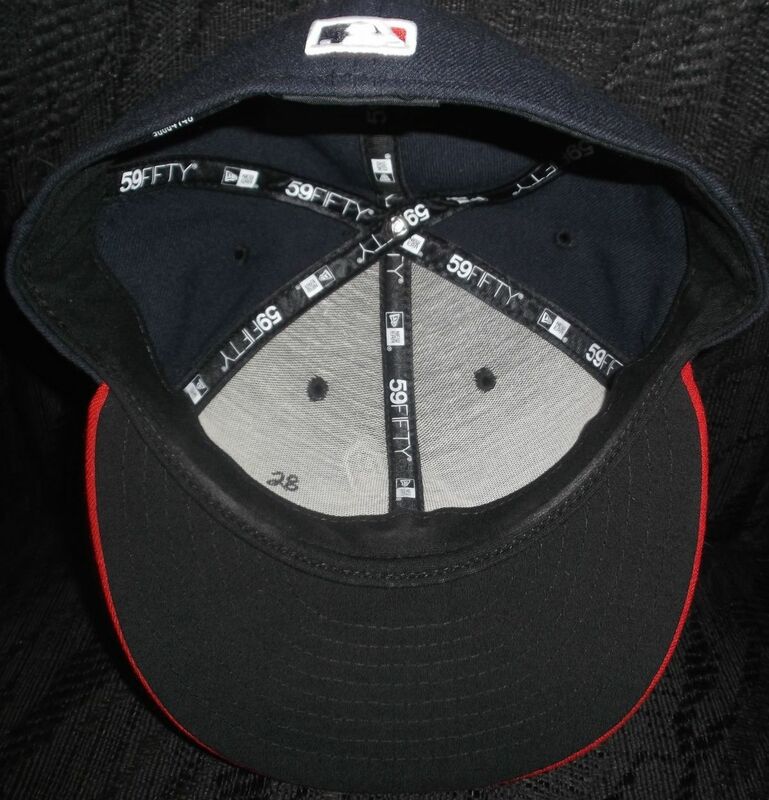 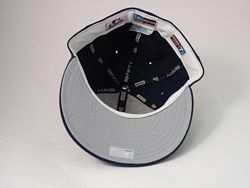 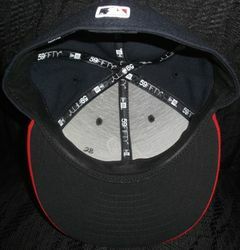 An alternate cap with an "I" logo and silver trim appears and is worn with a new alternate sleeveless jersey. 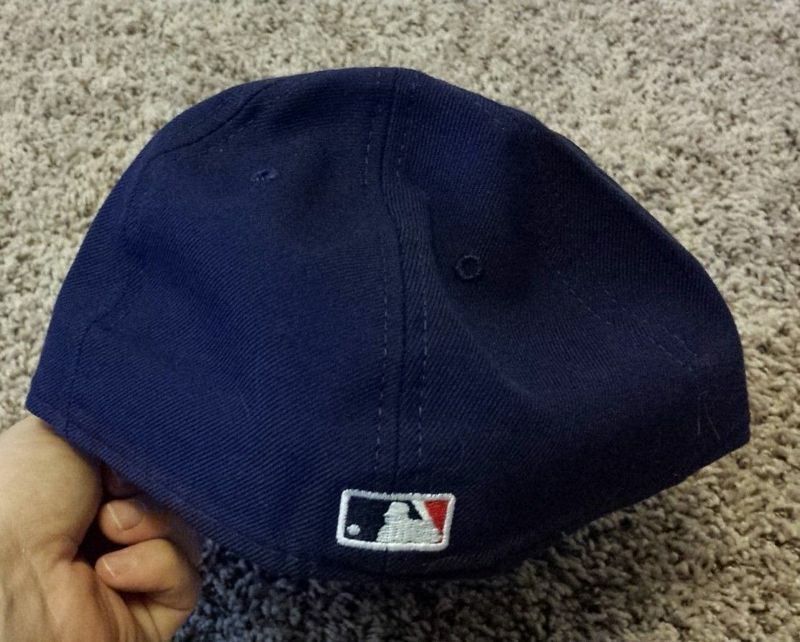 From what I've seen, the logo on the road cap gets smaller (the home cap logo would also shrink a year later). 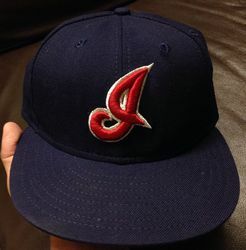 Anyone have other info? A silver outline replaces white around Chief Wahoo who gets smaller. 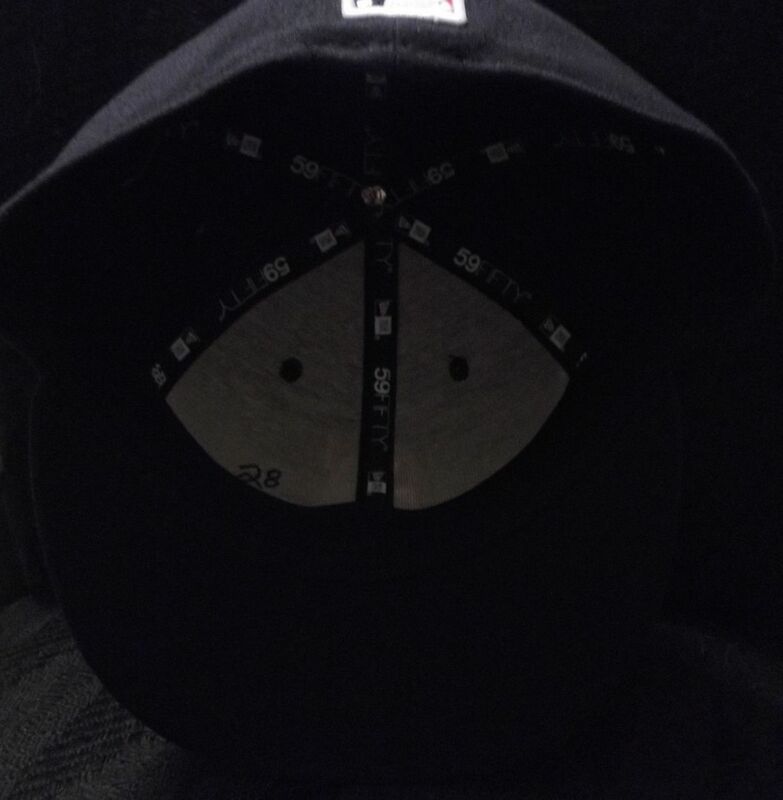 Silver outlines change back to white. 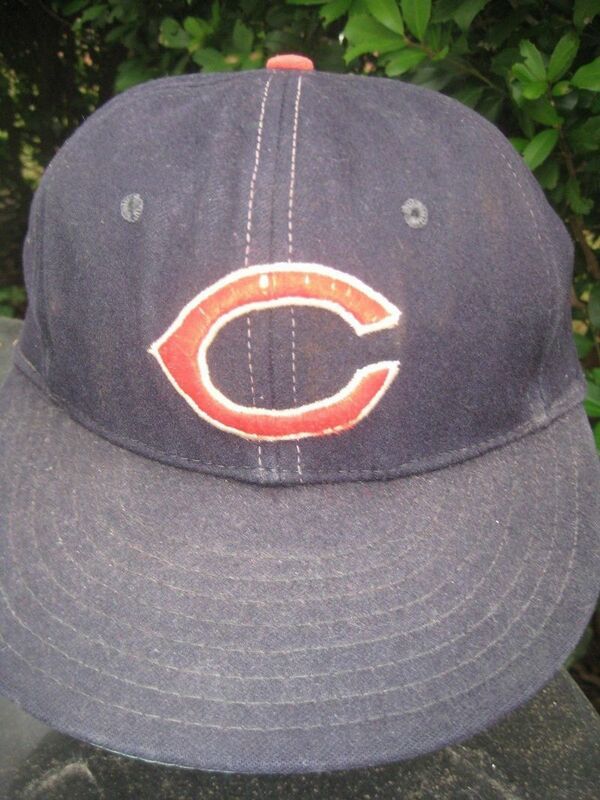 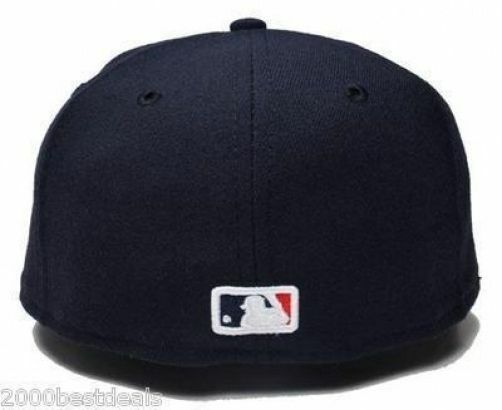 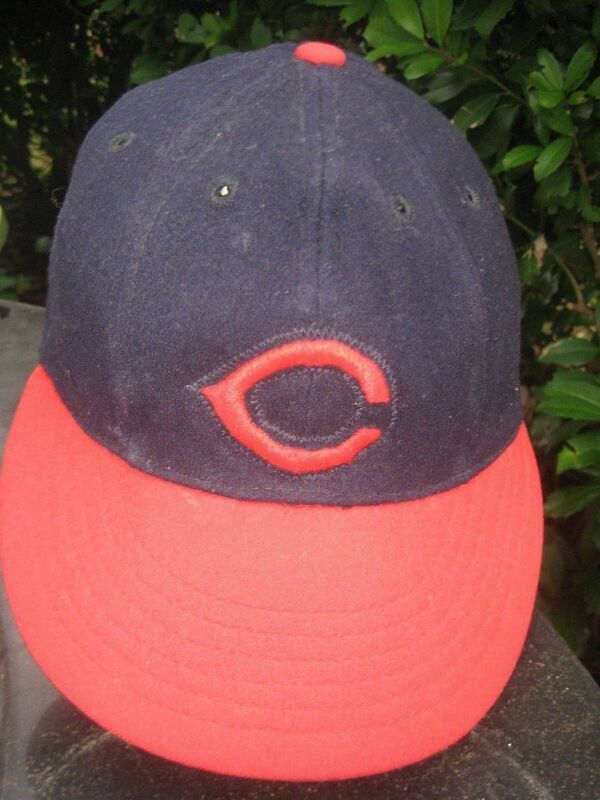 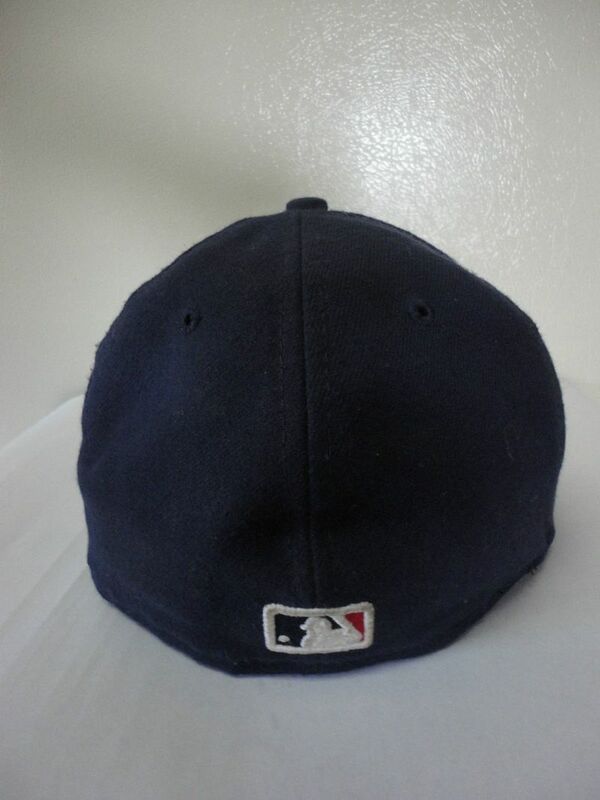 An alternate navy cap with a "C" logo debuts. 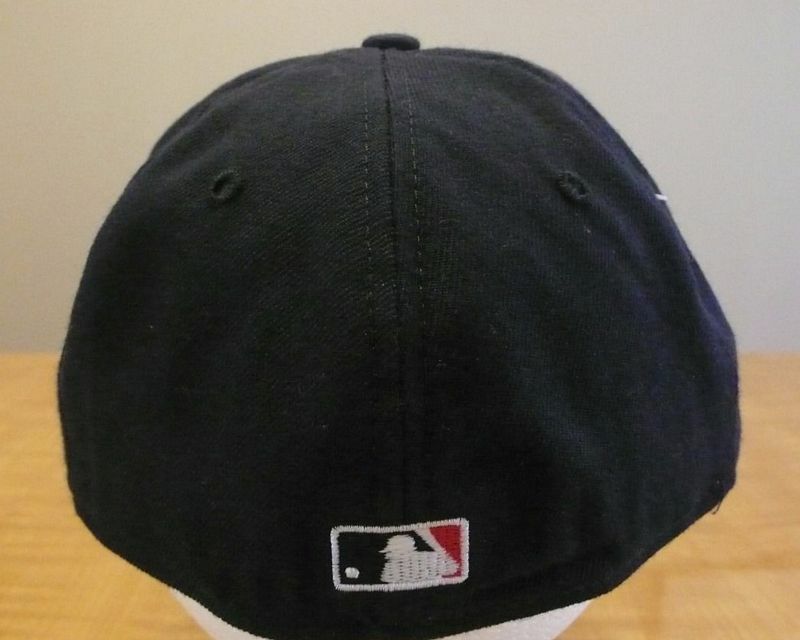 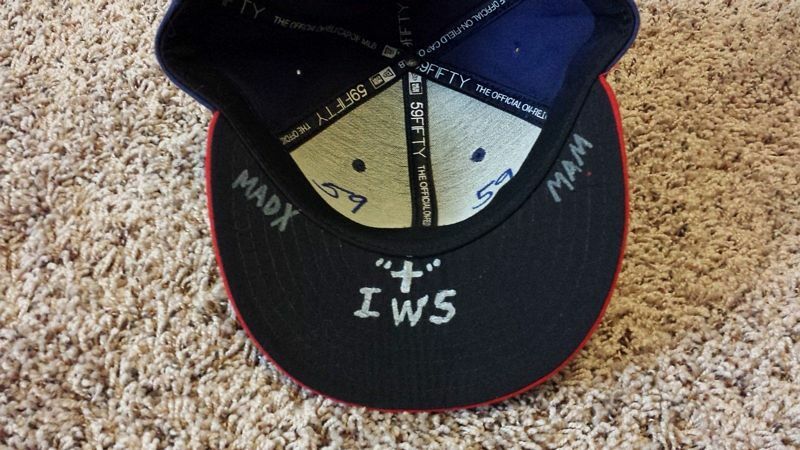 The "I" logo cap is rarely (ever?) 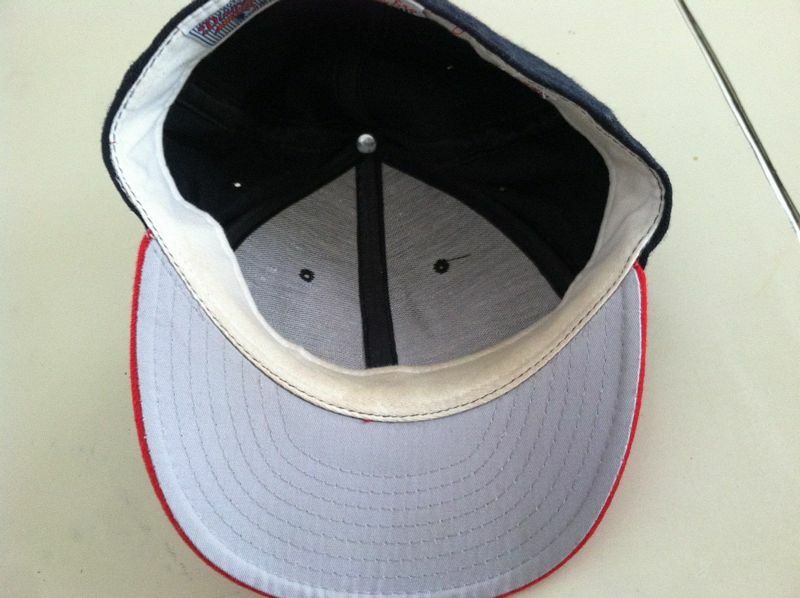 worn. 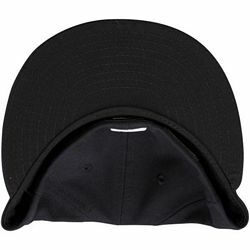 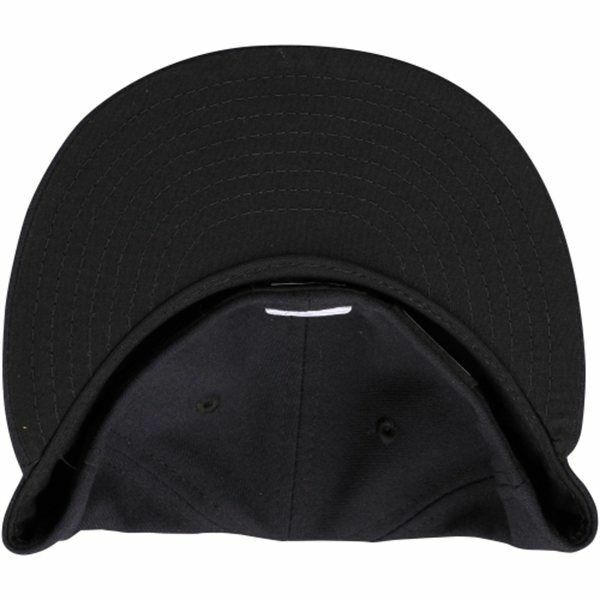 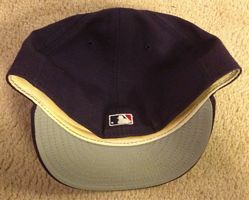 Caps turn to polyester with black undervisors. 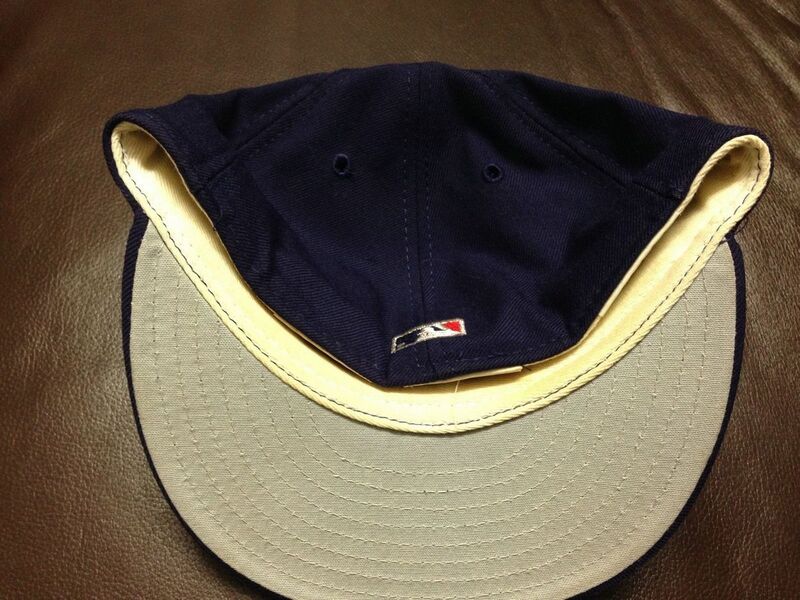 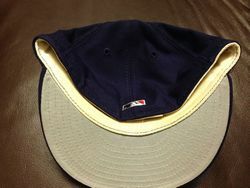 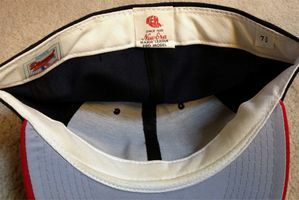 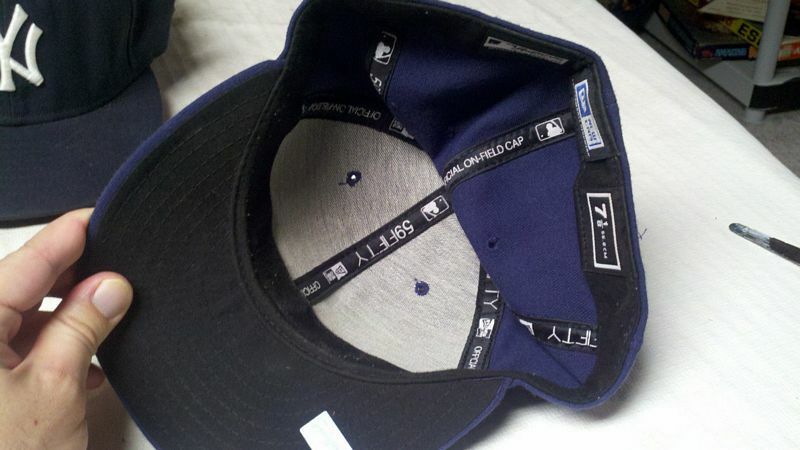 The navy "C" cap becomes the road cap. 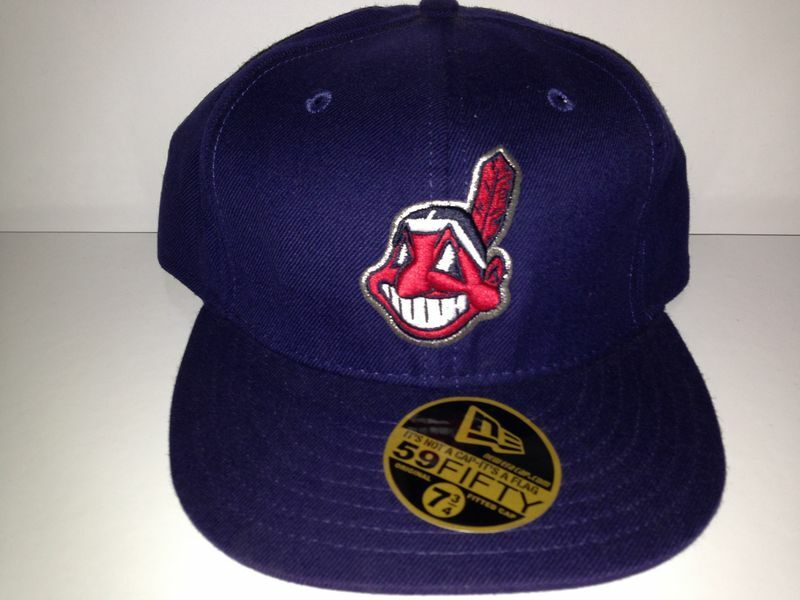 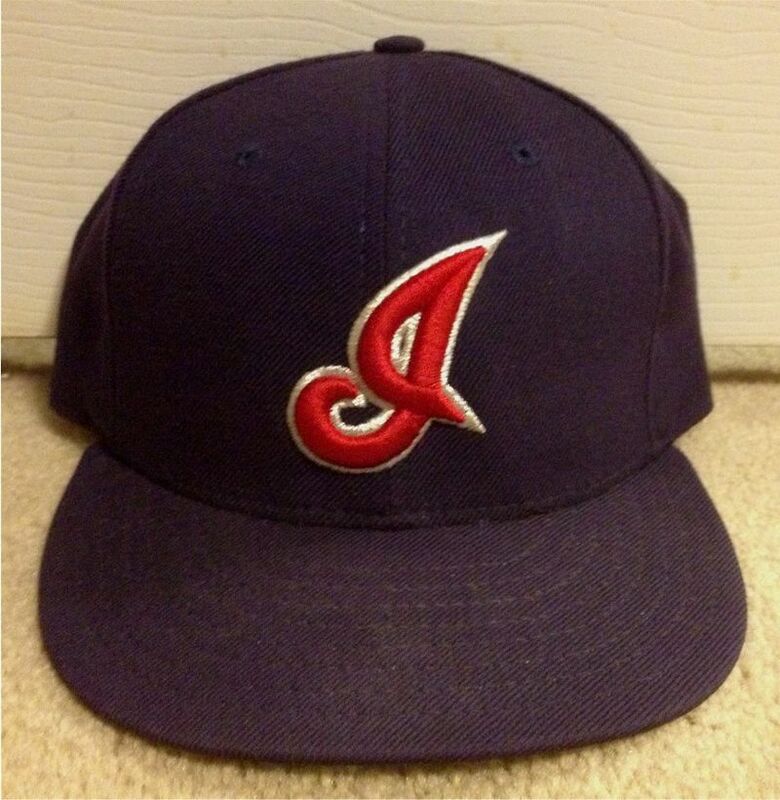 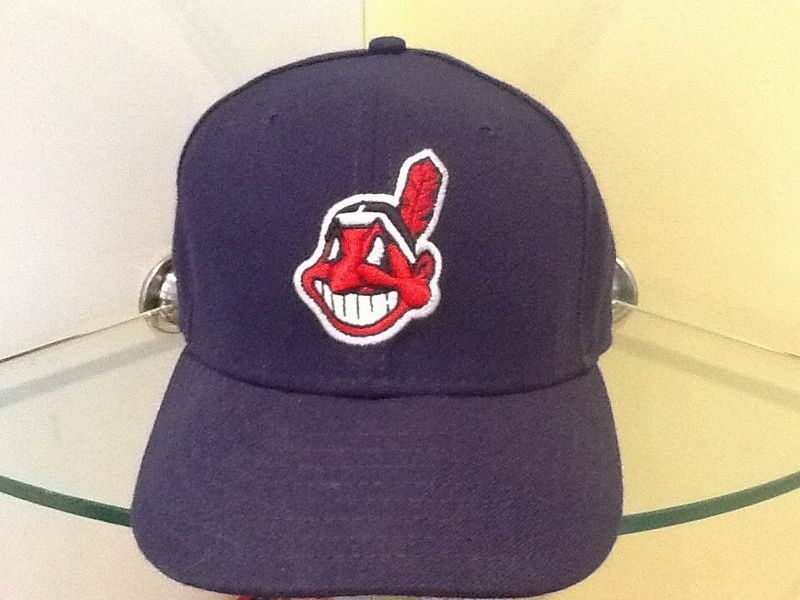 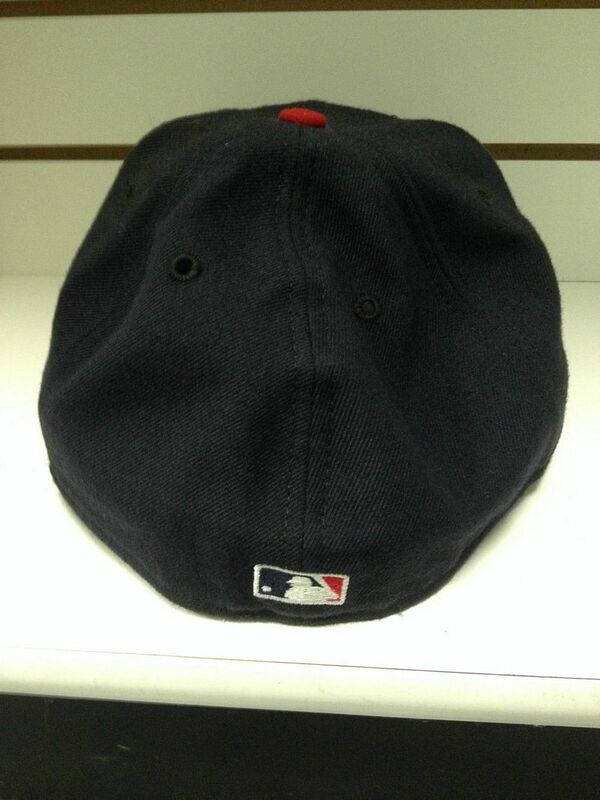 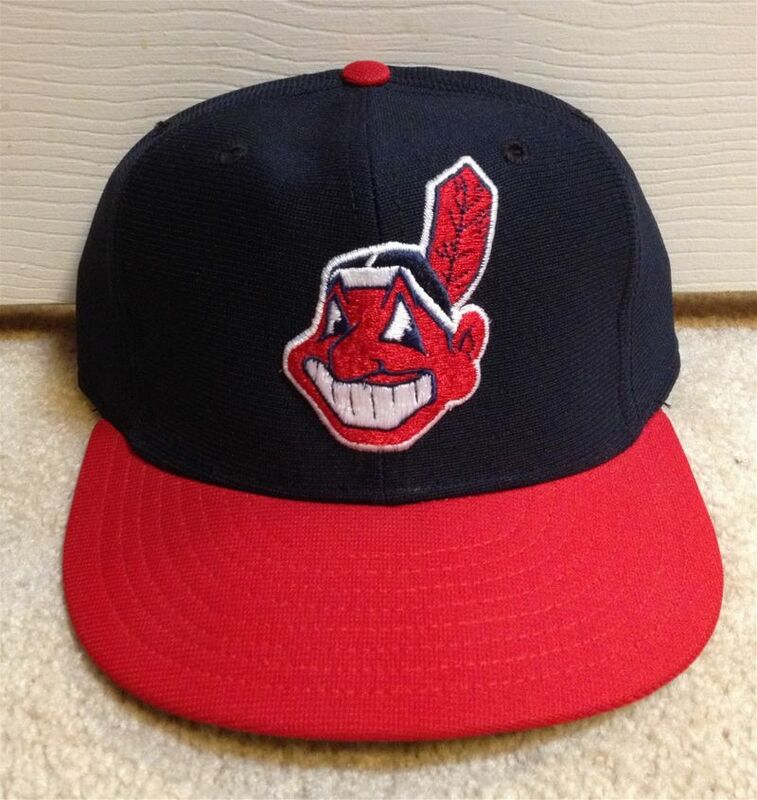 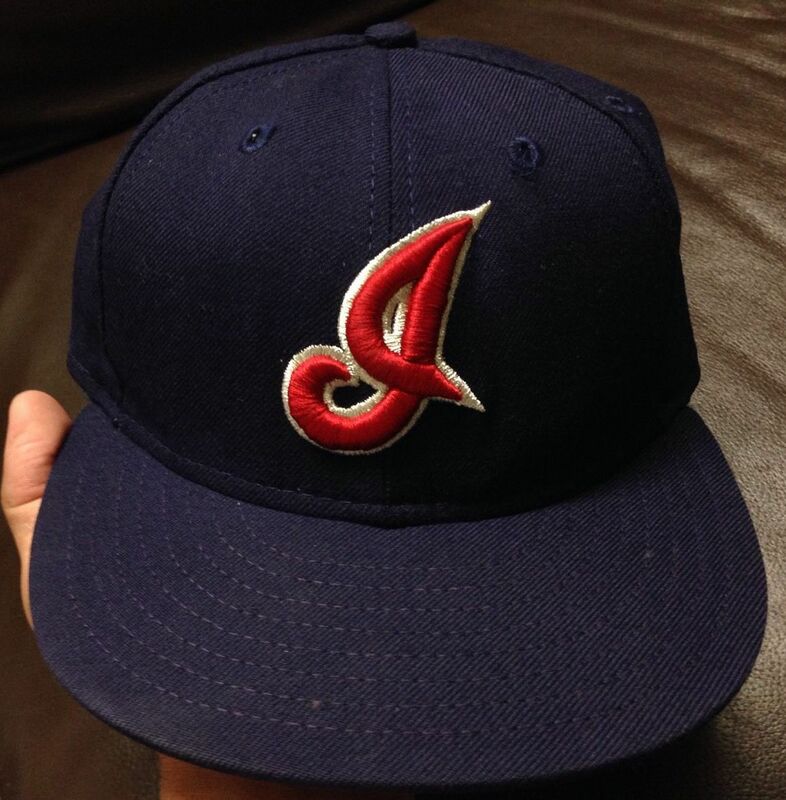 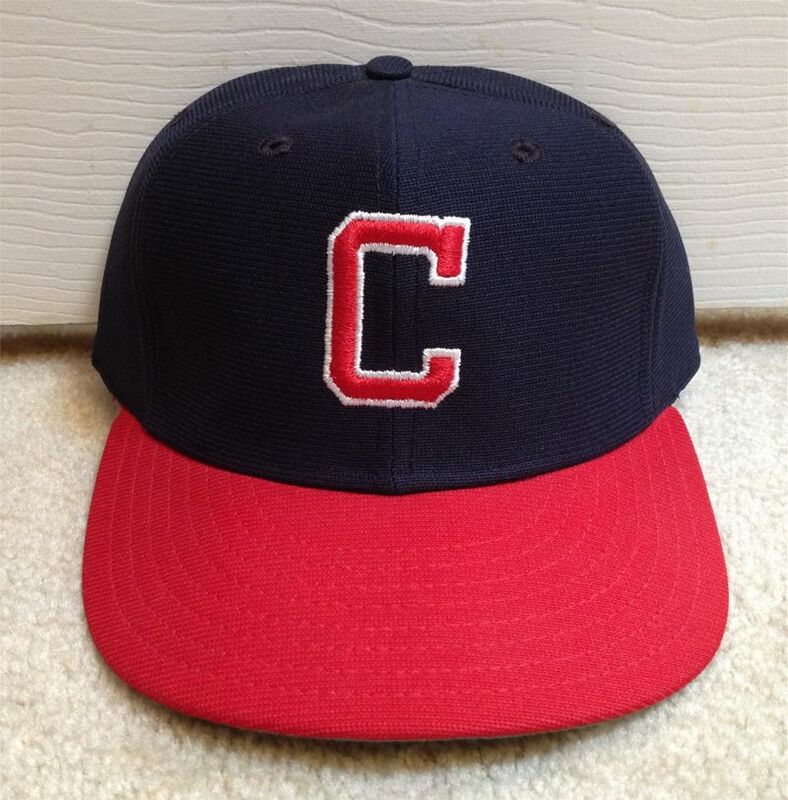 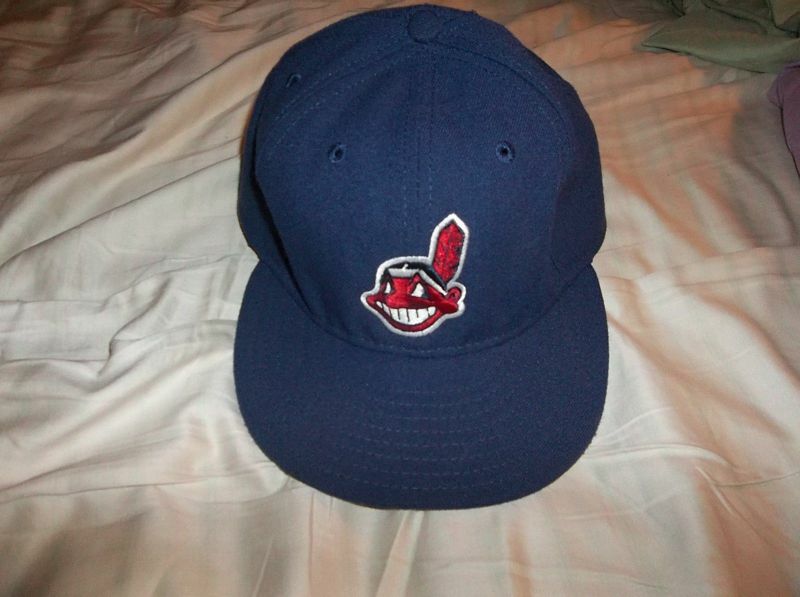 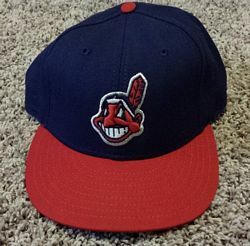 The navy Chief Wahoo cap is now a road alternate. 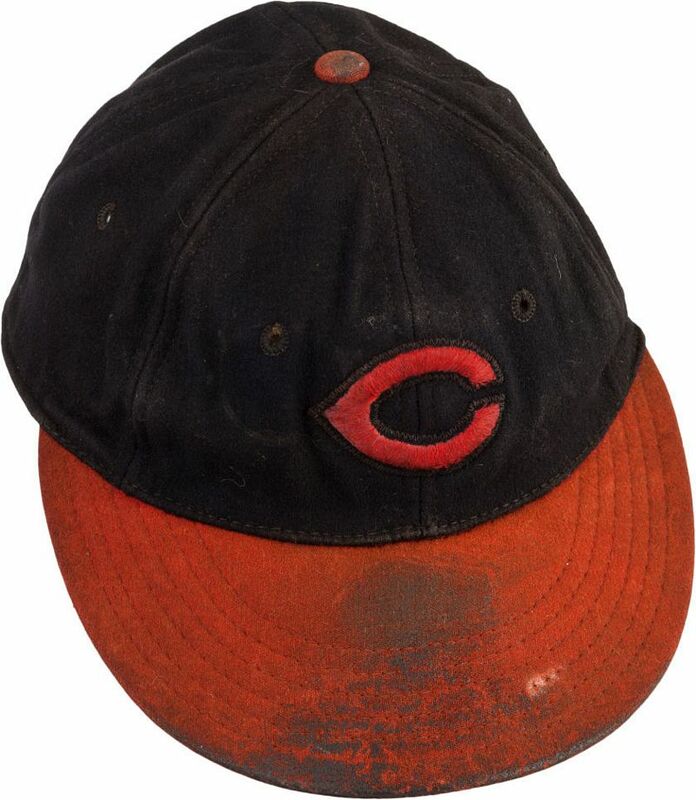 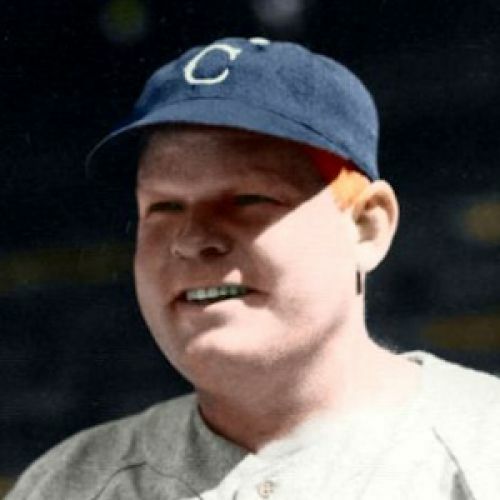 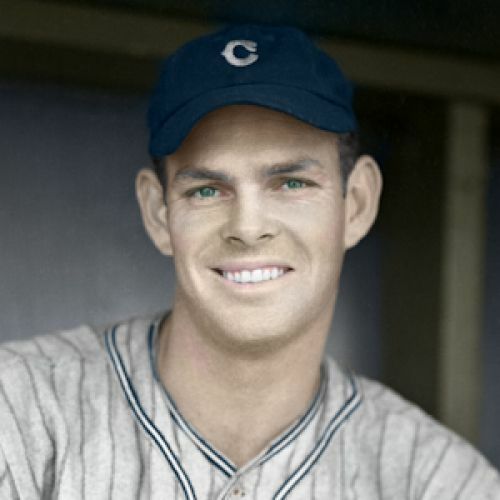 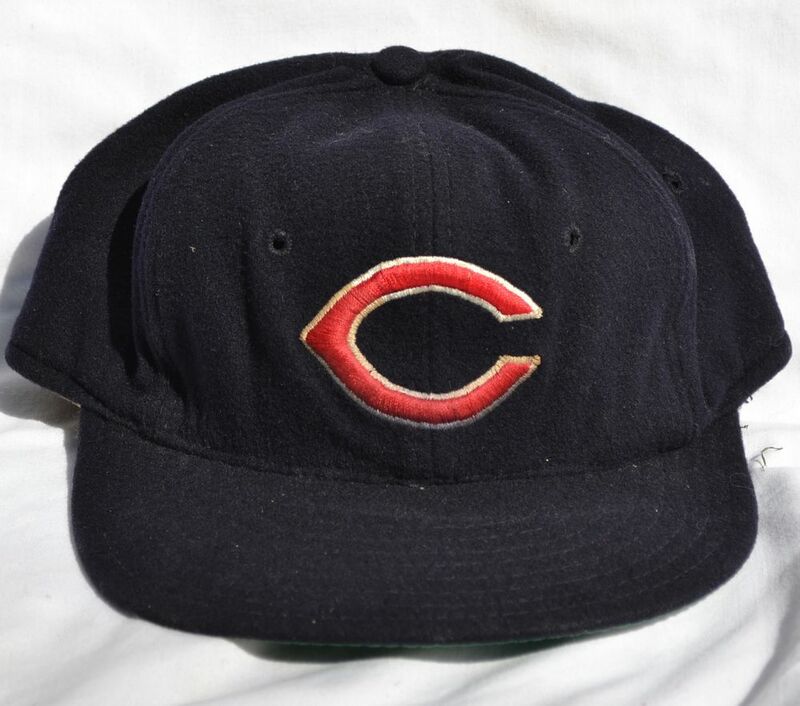 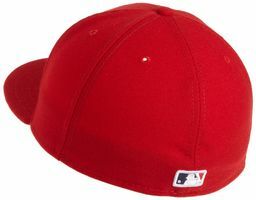 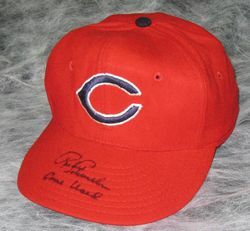 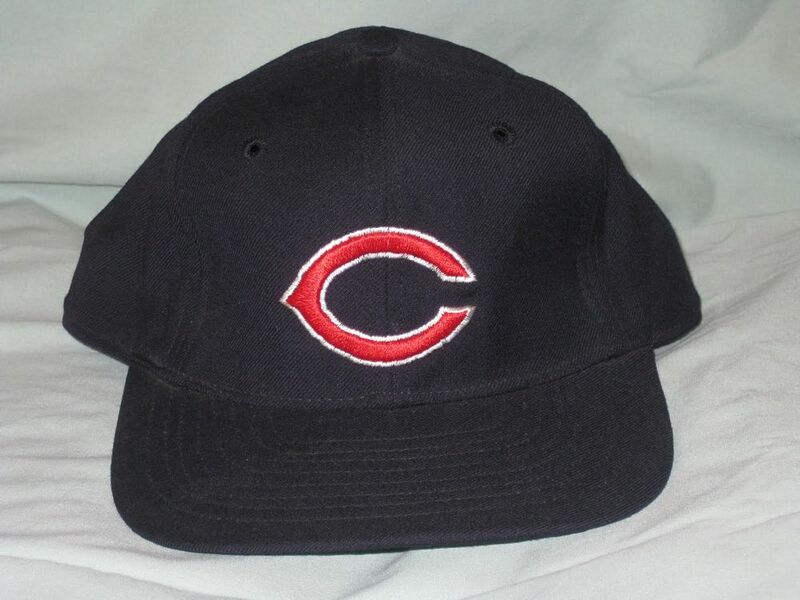 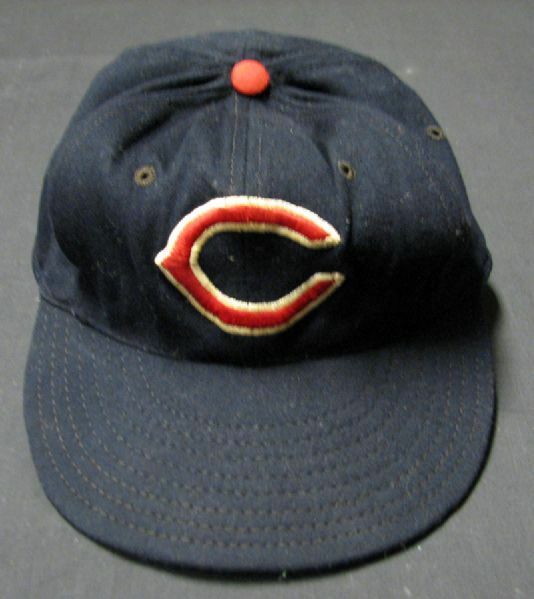 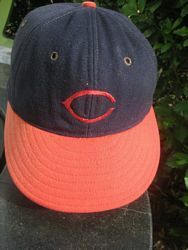 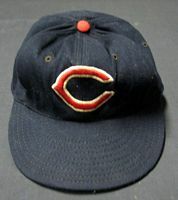 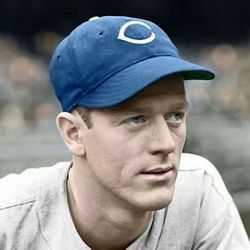 A red "C" logo cap is introduced for use with the home alternate jersey. The "I" logo cap is dropped. 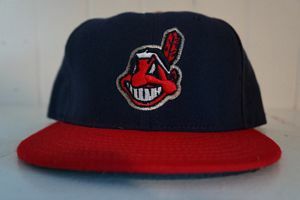 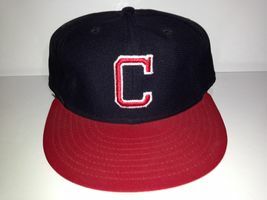 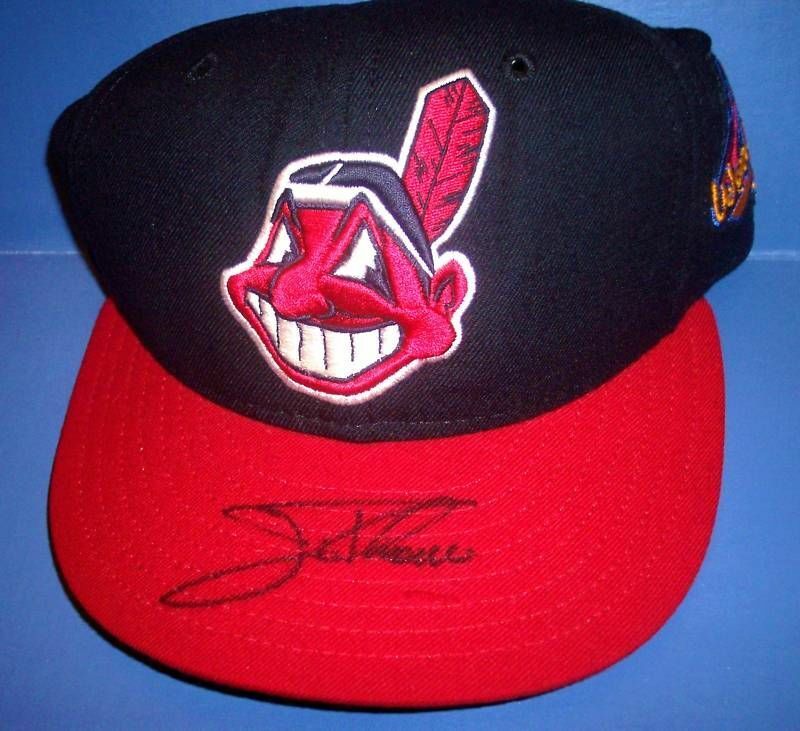 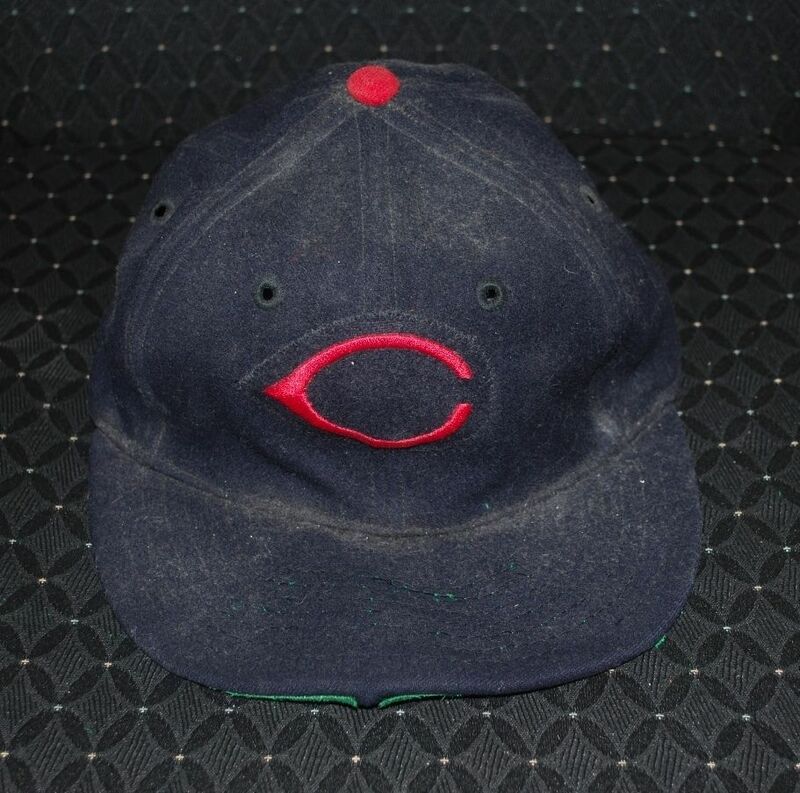 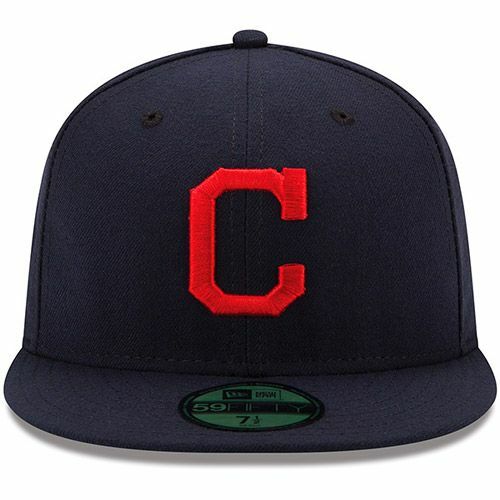 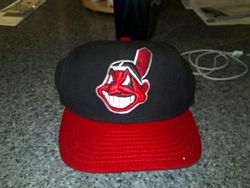 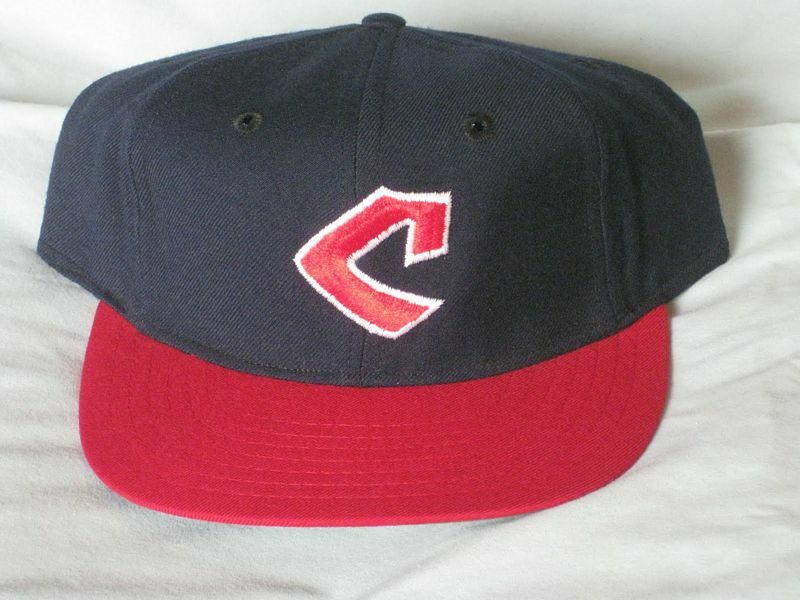 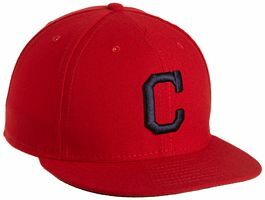 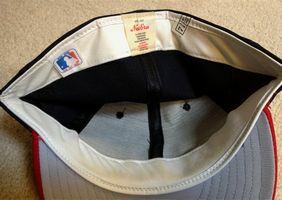 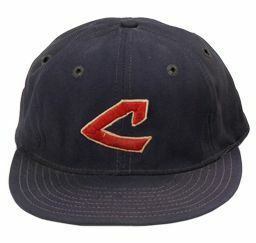 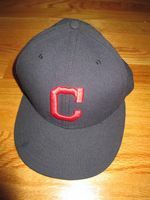 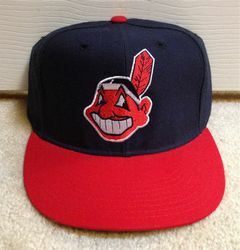 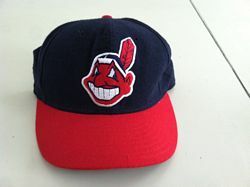 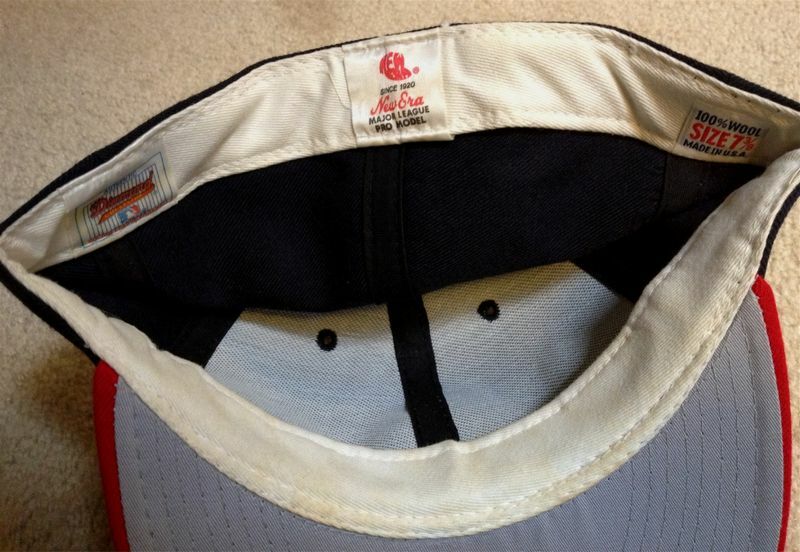 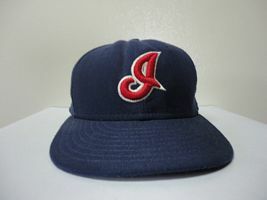 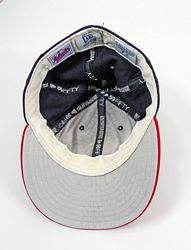 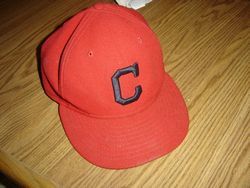 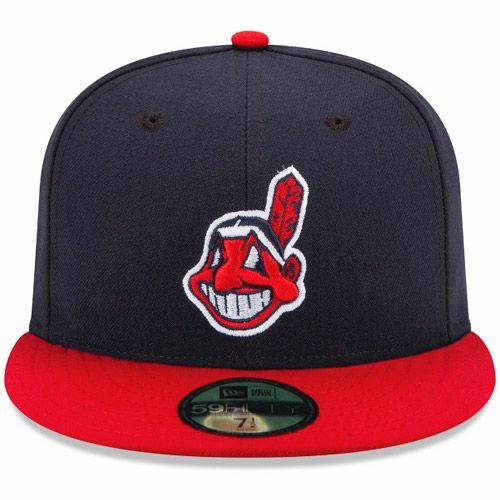 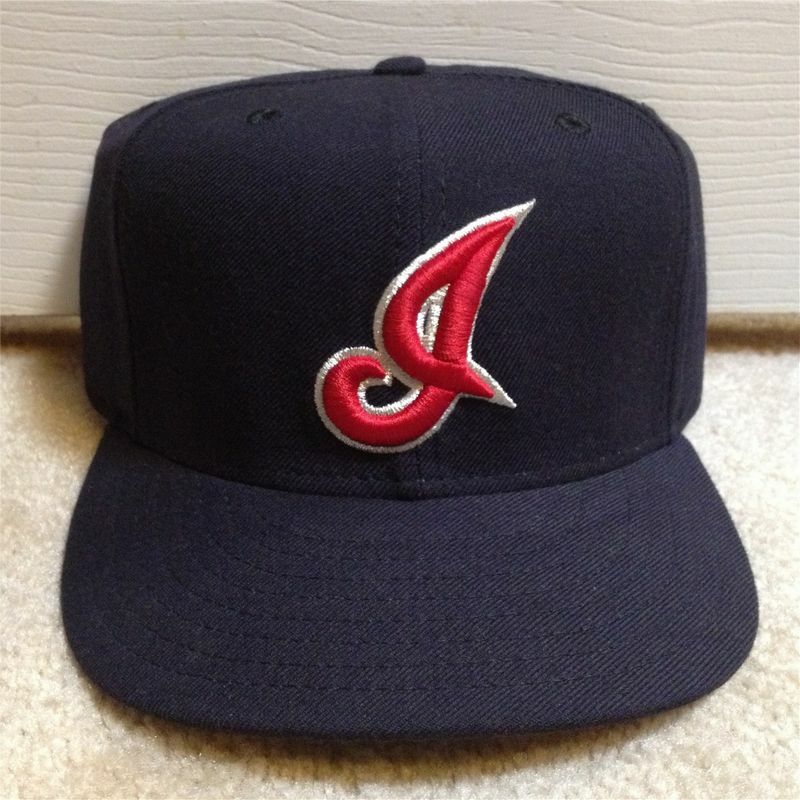 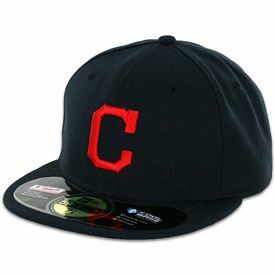 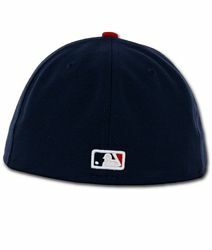 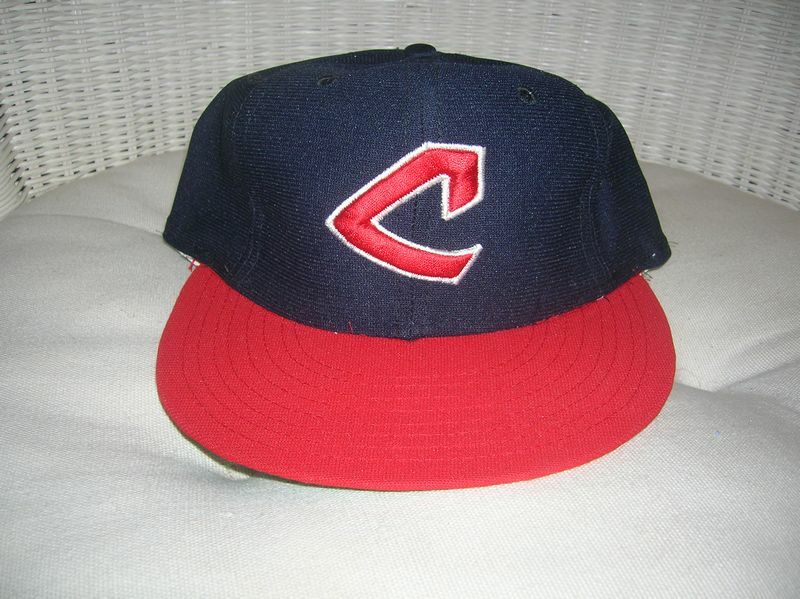 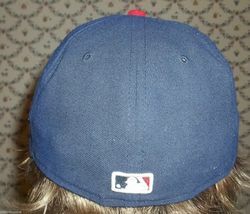 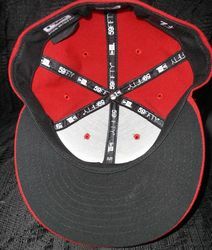 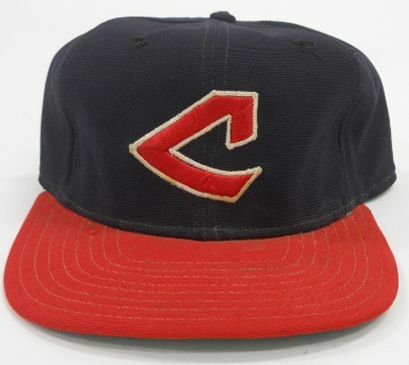 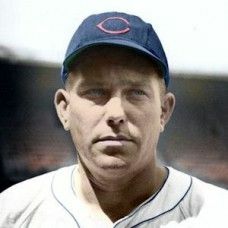 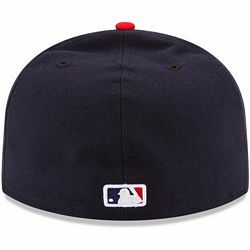 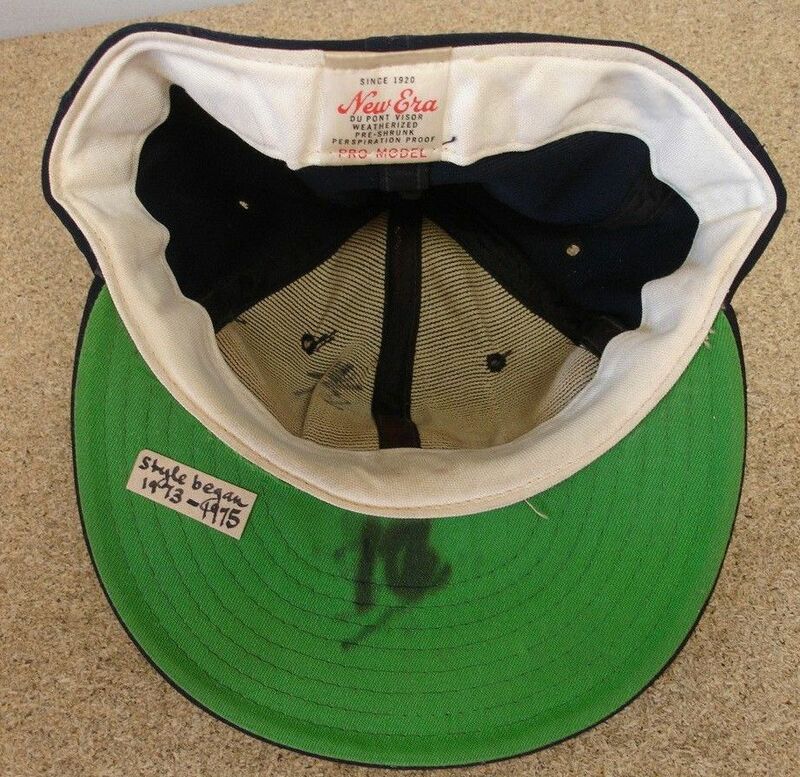 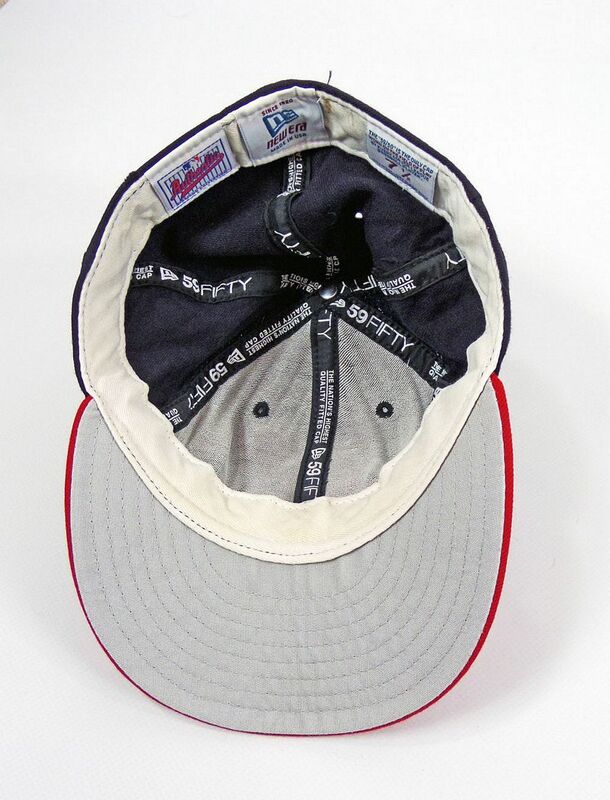 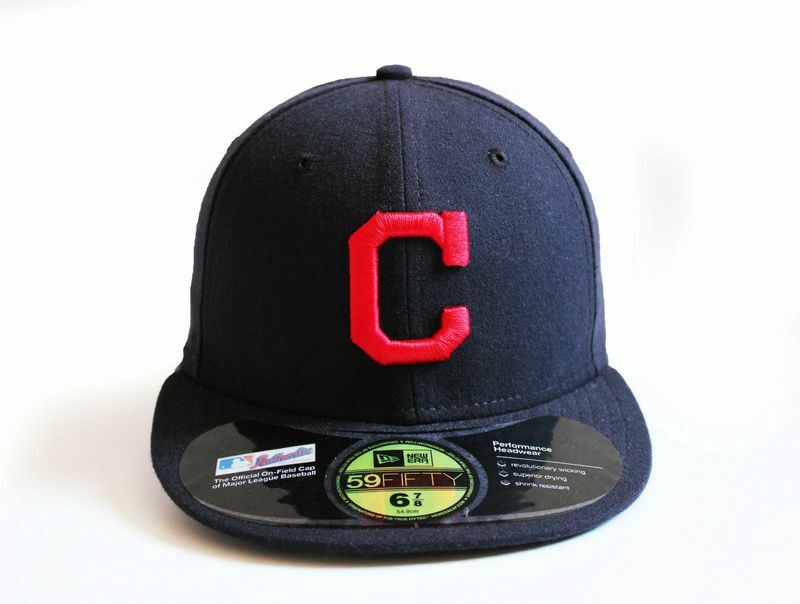 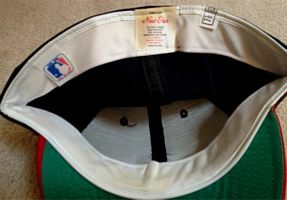 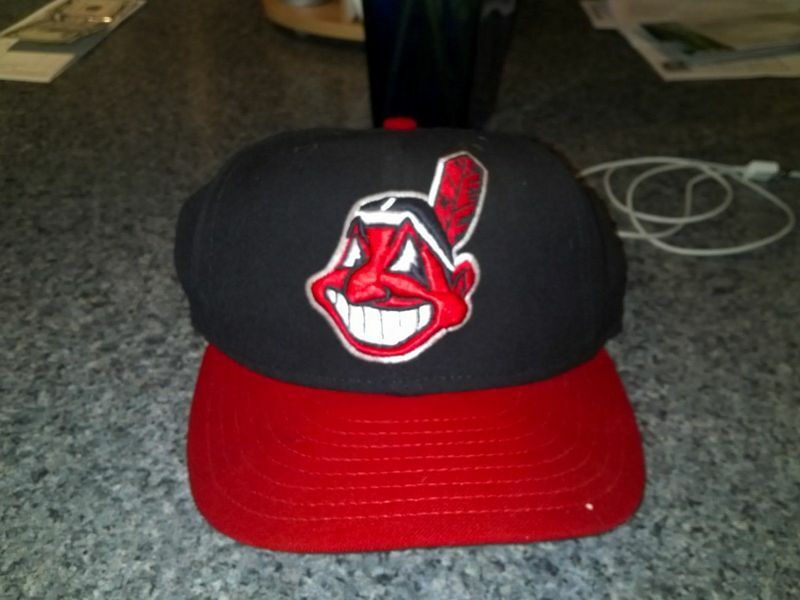 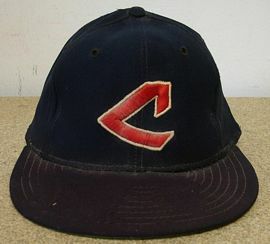 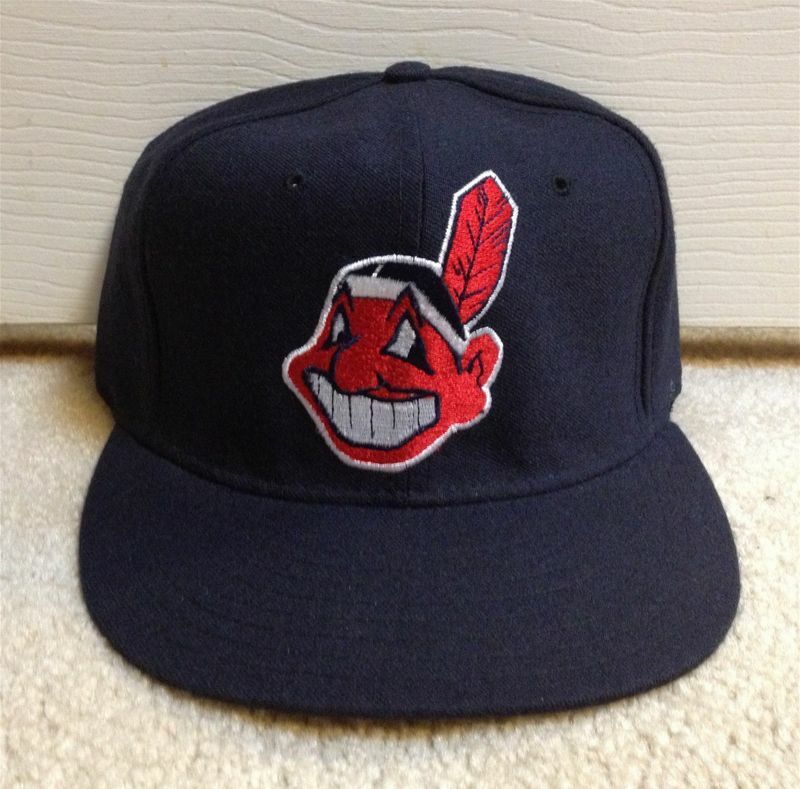 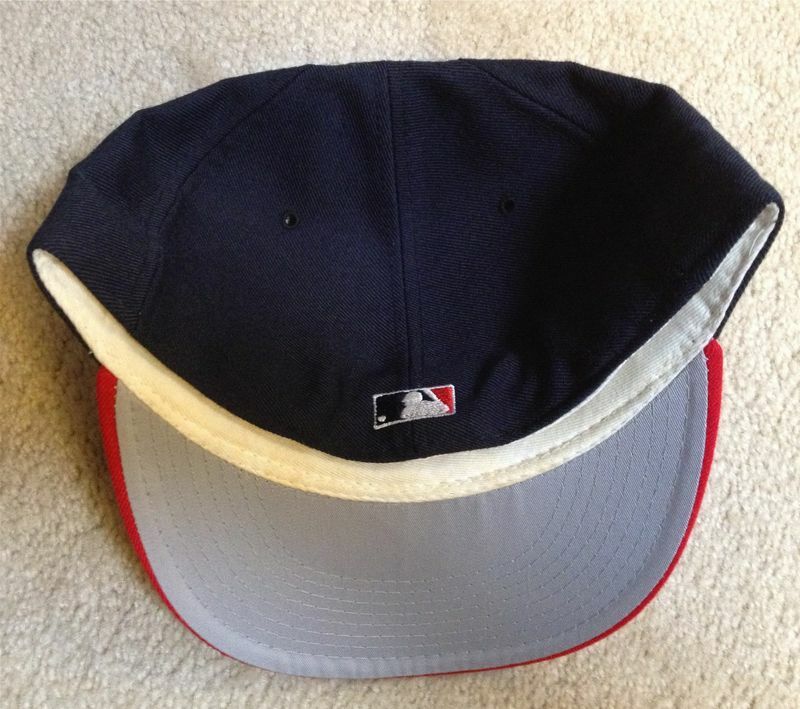 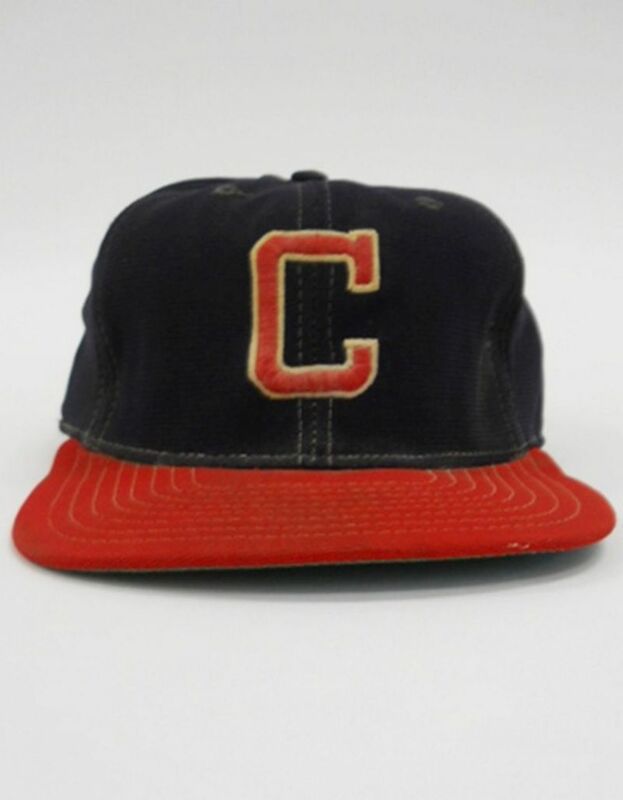 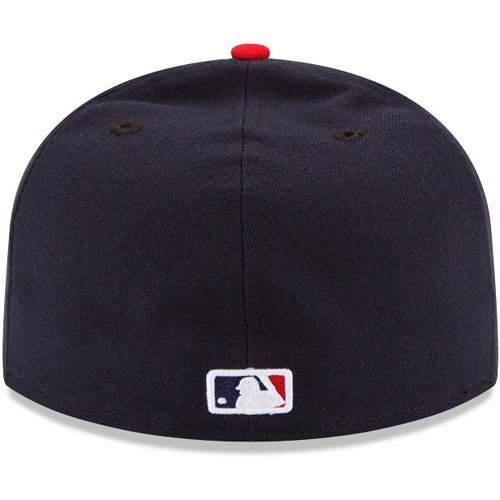 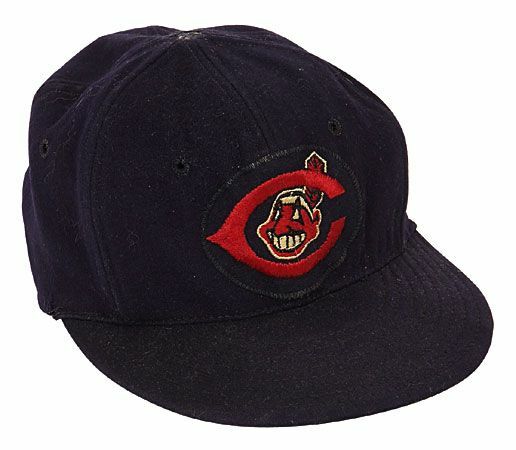 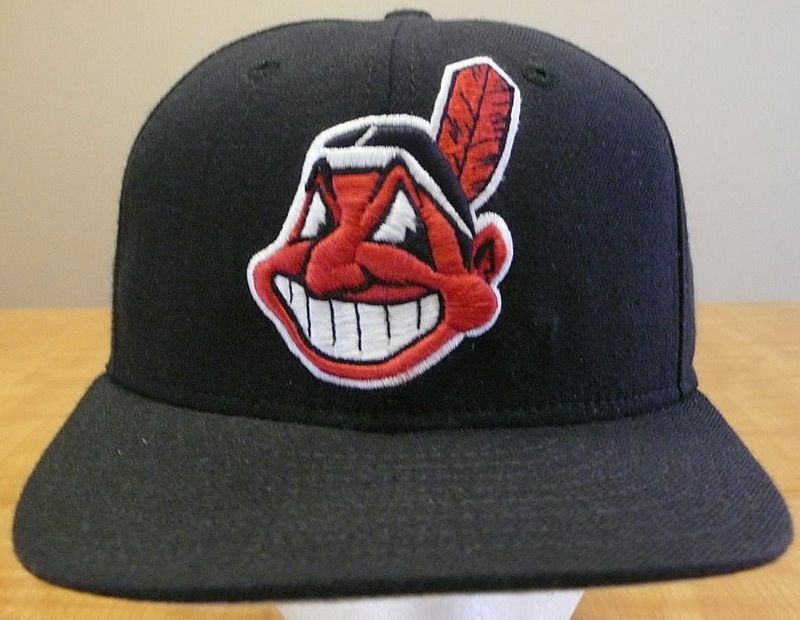 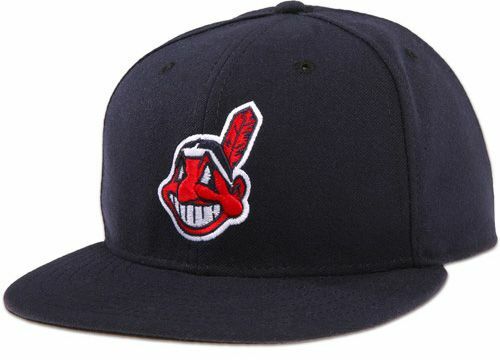 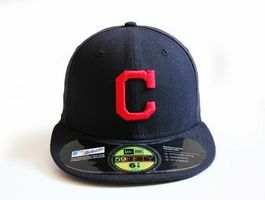 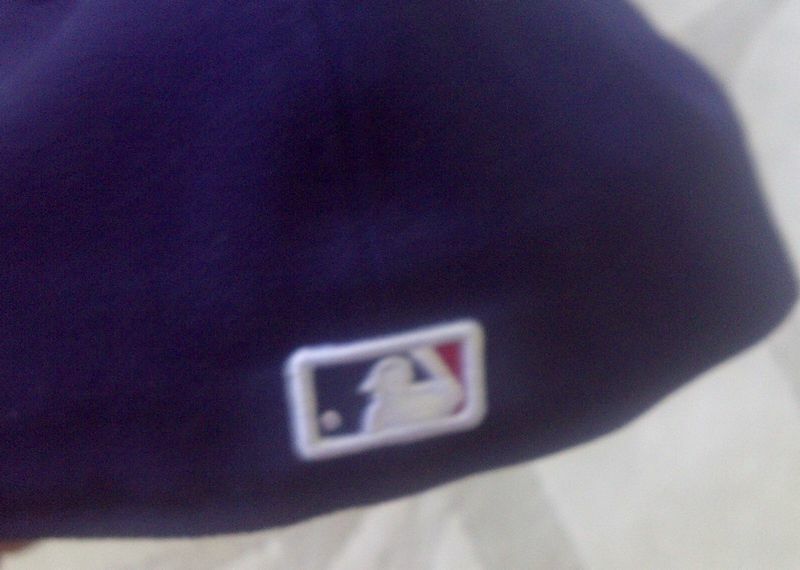 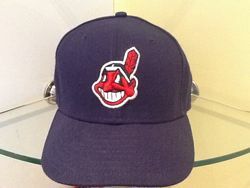 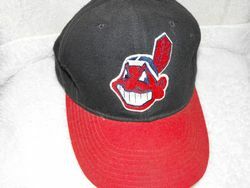 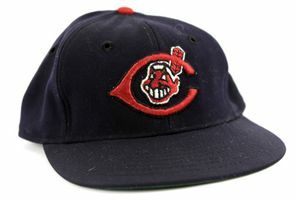 The color of the two Chief Wahoo caps is darkened to match the road cap.